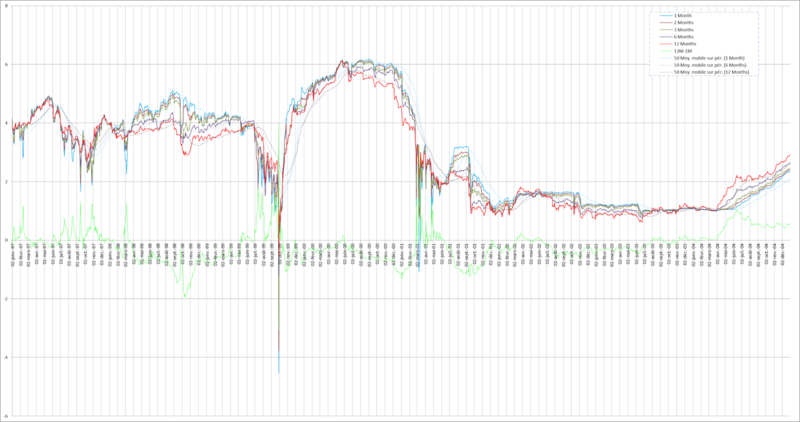 You can click on each chart for a better rendering and zooming. 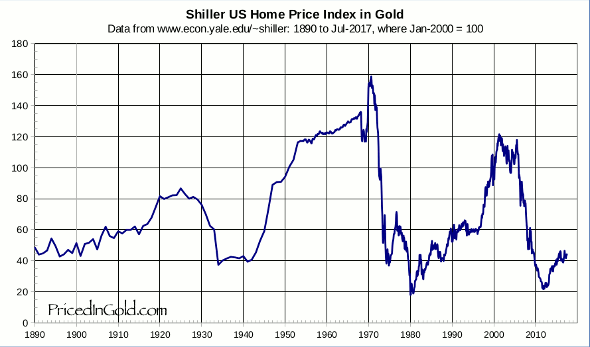 3/25/2014 St Louis FED announced to remove one month later all FRED existing and archived series relative to Dow Jones, S&P500, Case-Shiller indexes. On 4/25/2014, a new announcement explained the series will be kept available but will include only 10 years of moving daily history. 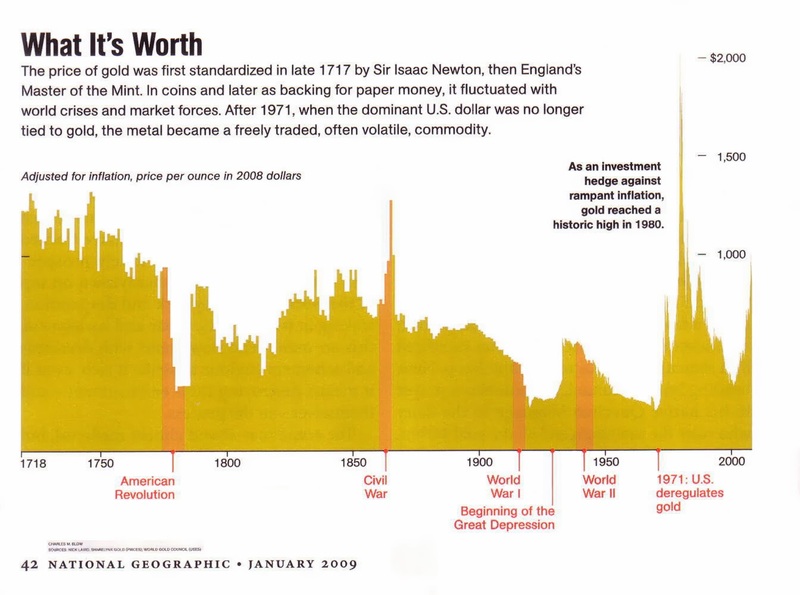 Source: Conscience-Sociale.org; data series 1791-2012 from Samuel H. Williamson, MeasuringWorth, August 2013. 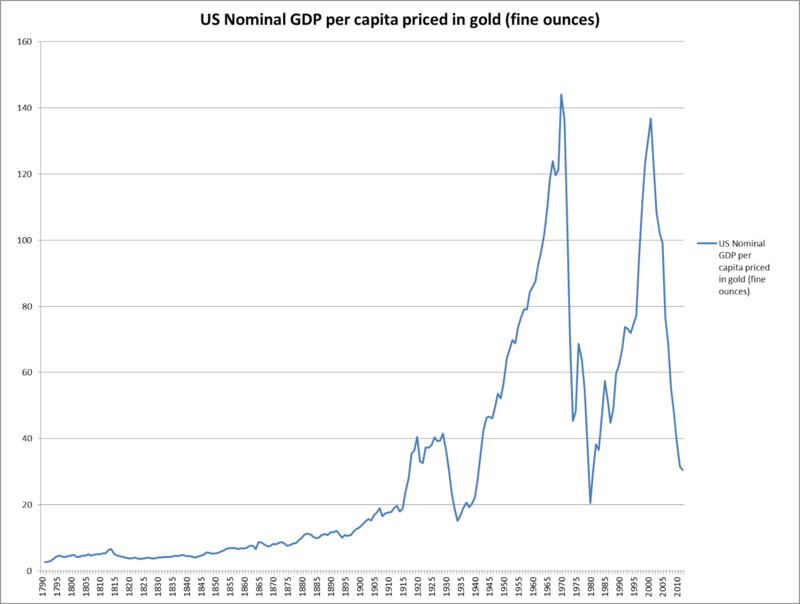 Same data series for U.S. till 1970 with exponential regression. 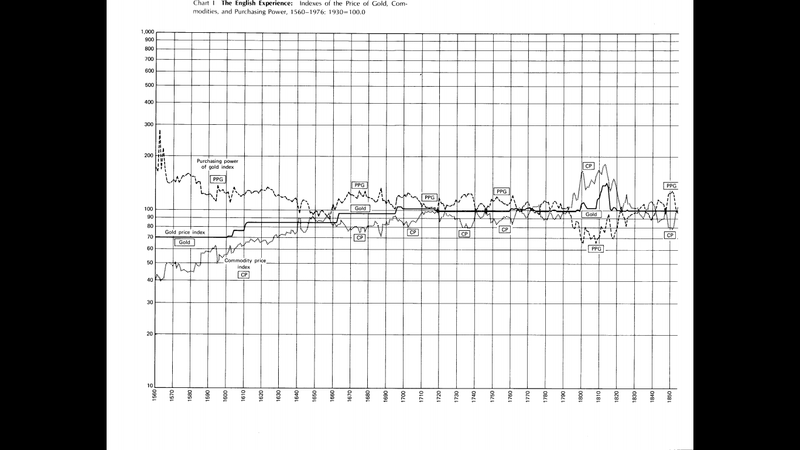 Source: Conscience-Sociale.org; data series 1830-2011 from Samuel H. Williamson, MeasuringWorth, August 2013. 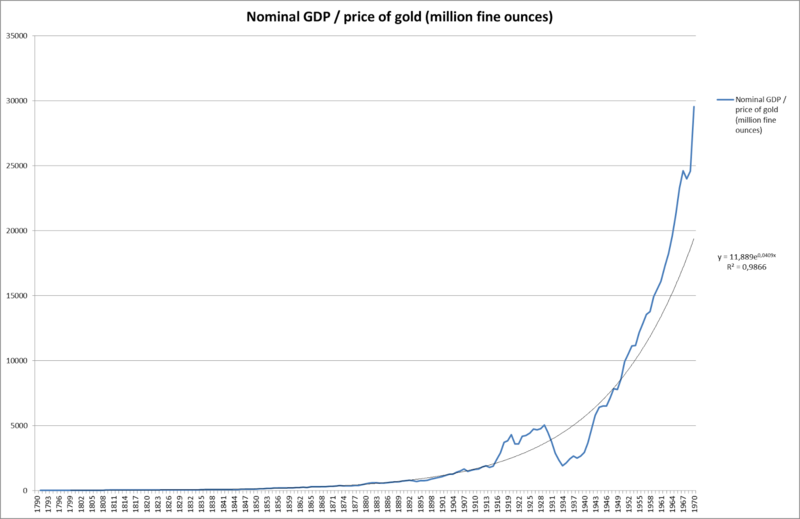 Same data series for UK till 1971 with exponential regression. 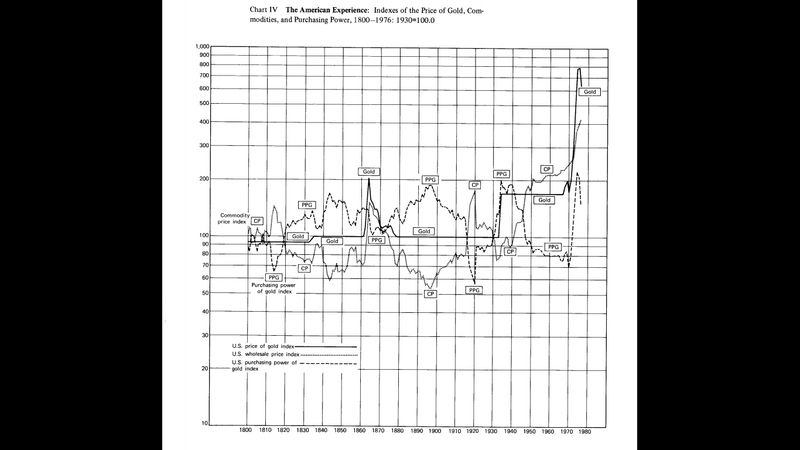 Source: Conscience-Sociale.org; data series 1830-2012 from Samuel H. Williamson, MeasuringWorth, August 2013. 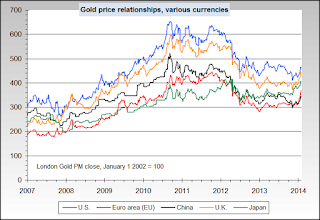 Does price of gold evolve together with "dollar strenght" on FX market ? Spot price: The price for cash ("immediate") settlement. 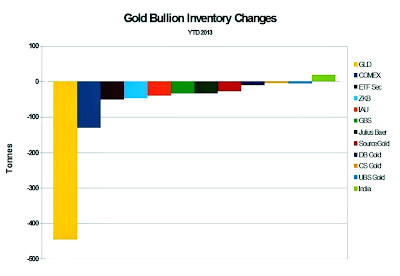 The bullion market operates on a two-day settlement (the value date is on the 2nd business day following the trade date). 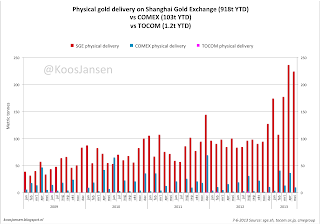 Comex ‘spot gold close’ is another reference price calculated as the average of the highest and lowest spot prices achieved during the last two minutes of daily trading at Comex. Trade Date: Date on which the price was set. 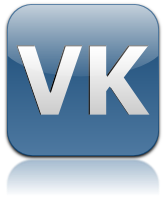 Value Date: Date on which payment of money and delivery of metal/currency occurs. 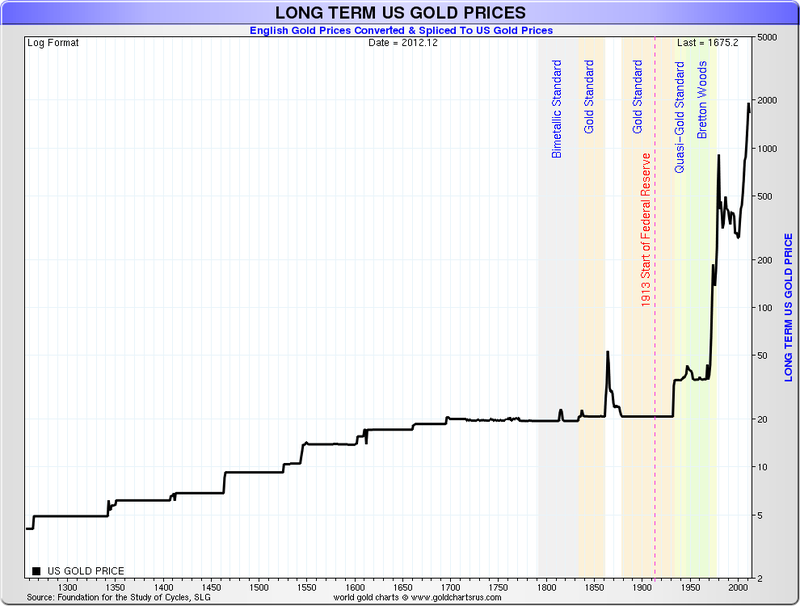 Bid: The price at which someone will buy, that is, the price you will be paid if you sell precious metal. 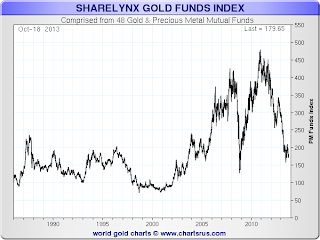 Ask or offer: The price at which someone will sell, that is, the price you will pay if you purchase precious metal. 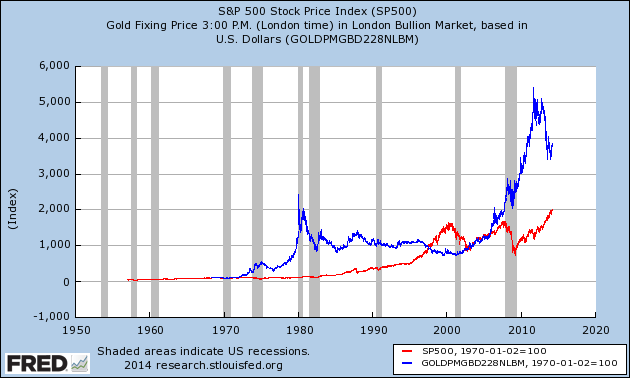 There is none single "market price": at any given time, there are a price for the buyers, and another price for the sellers. A buyer who wants to buy (i.e. to pay the recorded ask price) enters a "market order". He can as well record a new bid price. A seller who wants to sell has to record his bid price. He can as well enter another "market order" for a recorded ask price. It is very important to understand in details that only transactions at bid and ask prices exist (see a more detailed definition for them). Any others "prices" (last price, end of day price, market price) are only partial or statistical figures, and not a full perception of the market. 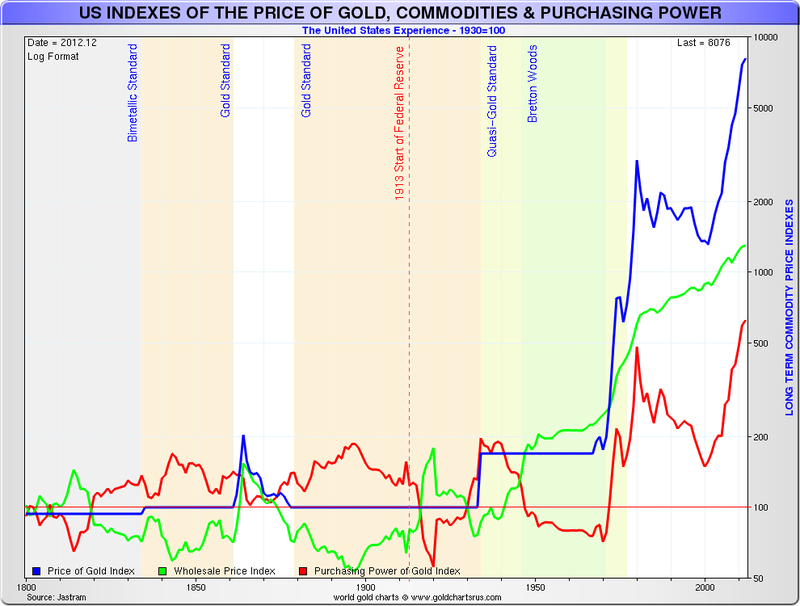 Bid/Ask live physical gold prices are available here (updated every 5s), or here in several currencies (updated every 1mn), or here top left, or here (or below on to top of these charts). 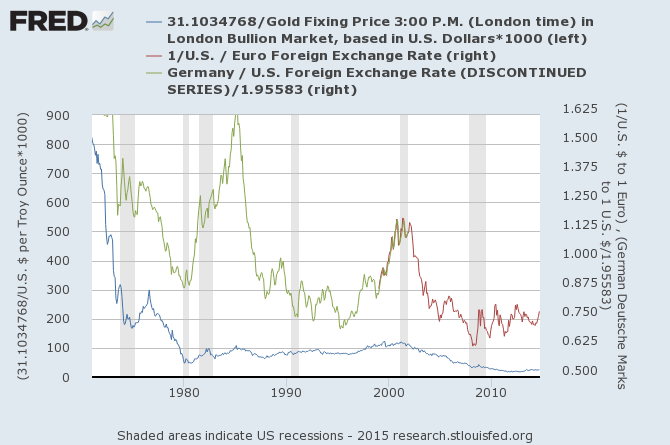 Do not confuse XAU (gold ounce/USD currency pair) ticker with the Philadelphia Gold and Silver Index (often ^XAU or $XAU). If you want to retrieve these historical bid/ask data, you can subscribe to a data feed and manage yourself the data collection. 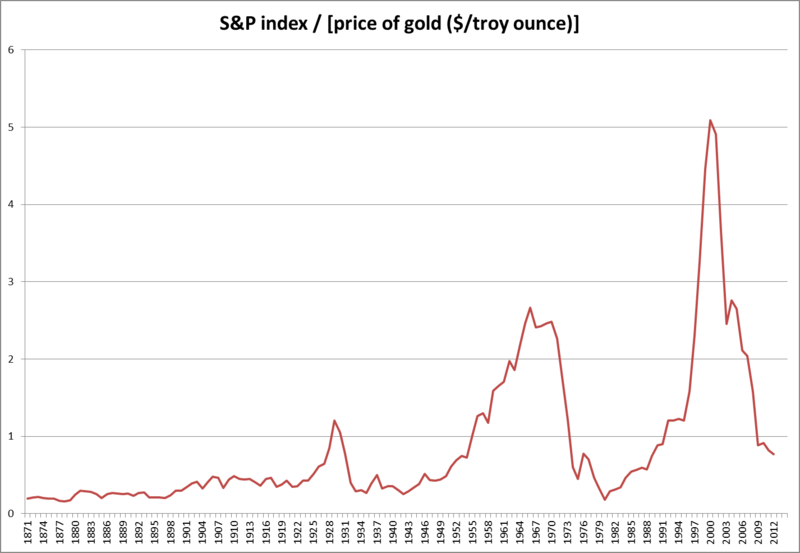 Perth mint are publishing free daily historical data but only with an average of bid and an average of ask spot prices. Take care of the currency you are using and the effect of continuous change rates. 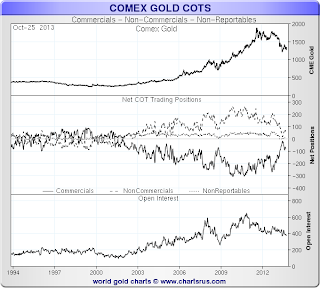 CME publishes a free daily historical csv file for COMEX gold futures quotations (link at the bottom of this page); column A/B means Ask/bid. 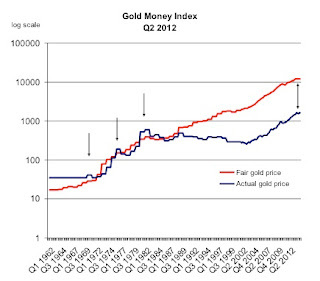 Fixing price: In addition to the two-way bid and offer quotations, LBMA gold fixing prices are available. They are single prices determined twice daily (also called bid prices here), quoted in US $, £ and € (details here). 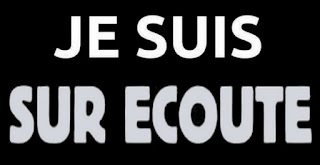 In France the fixing prices are determined once daily by the CPOR Devises company and published by Banque de France. 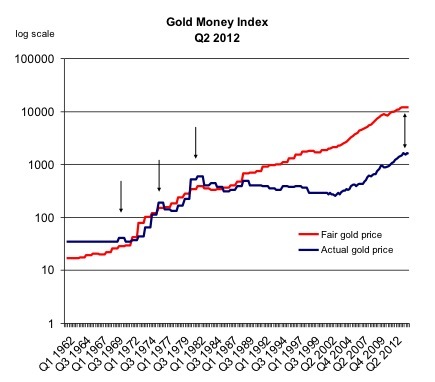 These fixing prices (often called 'prime CPOR') are NOT used to calculate the gold basis. 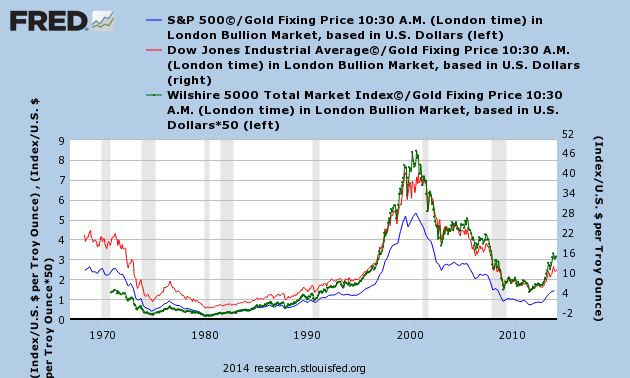 Inevitably these fixings are prone to manipulations by the market makers. 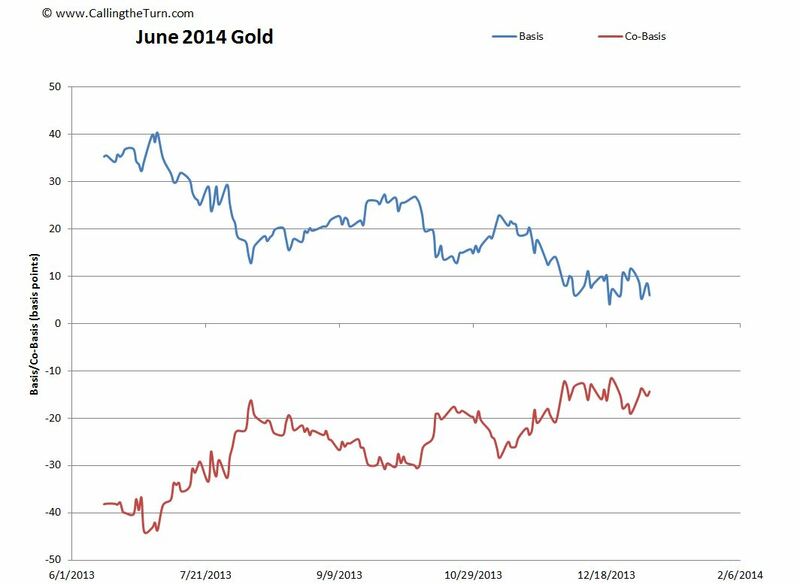 Gold Basis = Gold Futures(bid) - Spot(ask) = carry the gold. It is the difference between a forward price and a nearby price. It does not depend on cleared prices (settled transaction). The contract roll : Buyers of futures must make a decision by First Notice Day (2 working days before the end of the current month). 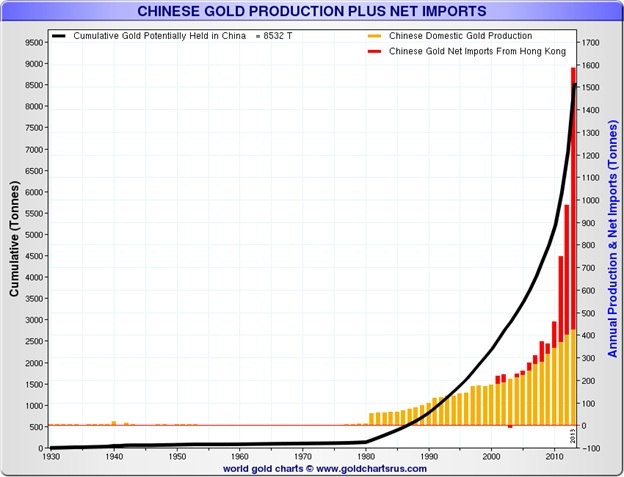 They can either put up the cash and demand delivery of one gold bar per contract. 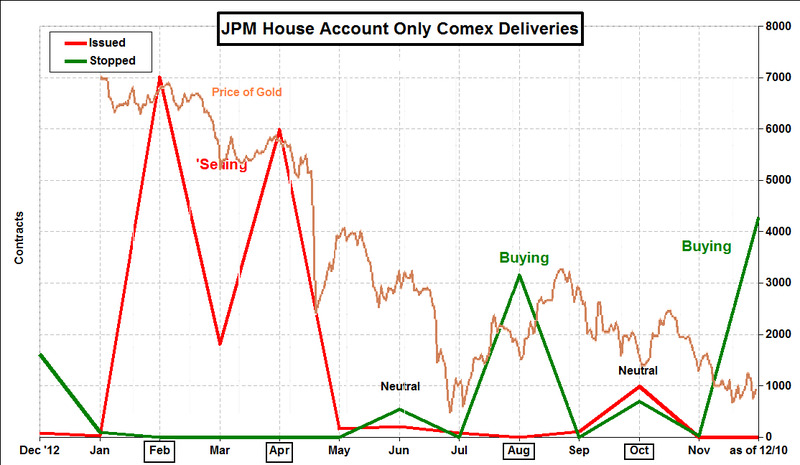 Or they must sell the contract for the next month, and buy a farther month if they want to keep their gold position. This will increase the open interest positions for the farther month contract. 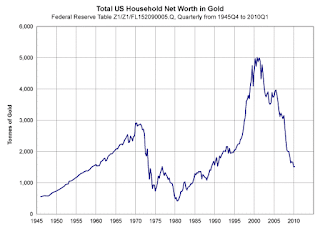 Keith Weiner (6/10/2013): "The gold basis is the profit one can make by carrying gold, which is buying gold and simultaneously selling a futures. 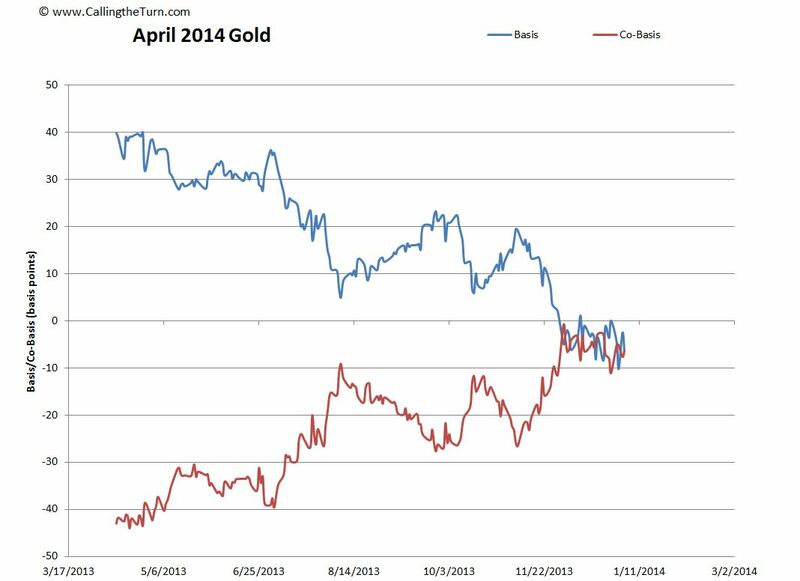 One is long a gold bar and short a gold futures which neatly offsets it. This return does include the bid-ask spread, but does not include exchange fees, storage and insurance, commissions, etc. Two things are certain. 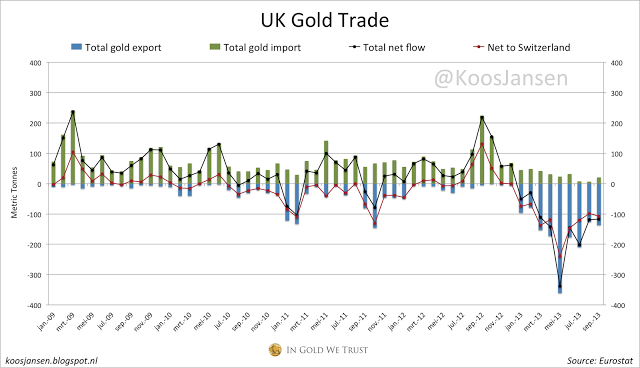 First, the gold carry trade is much less attractive at 0.2% than it was at 0.6% (given the costs, it may not be profitable at all). 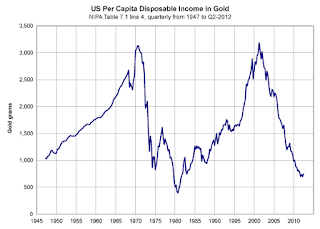 Second, as the basis falls, fewer and fewer traders will put on a carry position and, below their marginal rate of profit, none will put on a new carry. 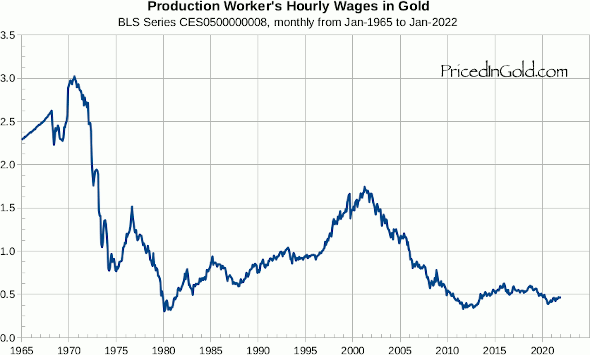 They may even take their carry position off, if the market offers a profit to do so (backwardation)." 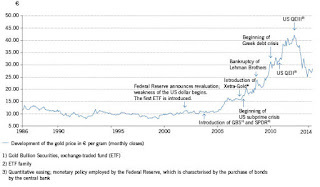 (10/6/2013): "We are interested in the changing equilibrium created when some market participants are accumulating hoards and others are dishoarding. 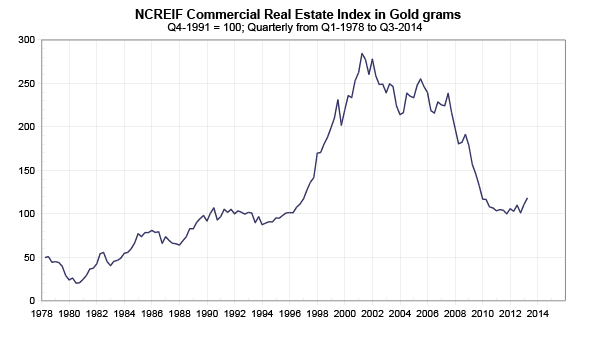 Of course, what makes it exciting is that speculators can (temporarily) exaggerate or fight against the trend. The speculators are often acting on rumors, technical analysis, or partial data about flows into or out of one corner of the market. 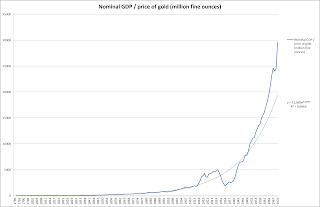 That kind of information can’t tell them whether the globe is, on net, hoarding or dishoarding.One could point out that gold does not, on net, go into or out of anything. Yes, that is true. 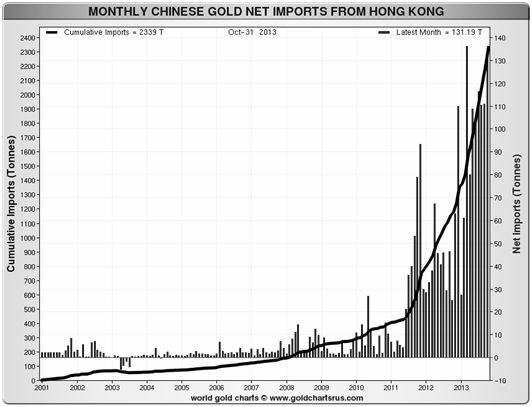 But it can come out of hoards and into carry trades. That is what we study. 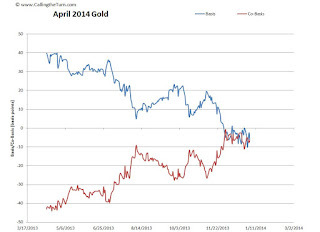 The gold basis tells us about this dynamic." 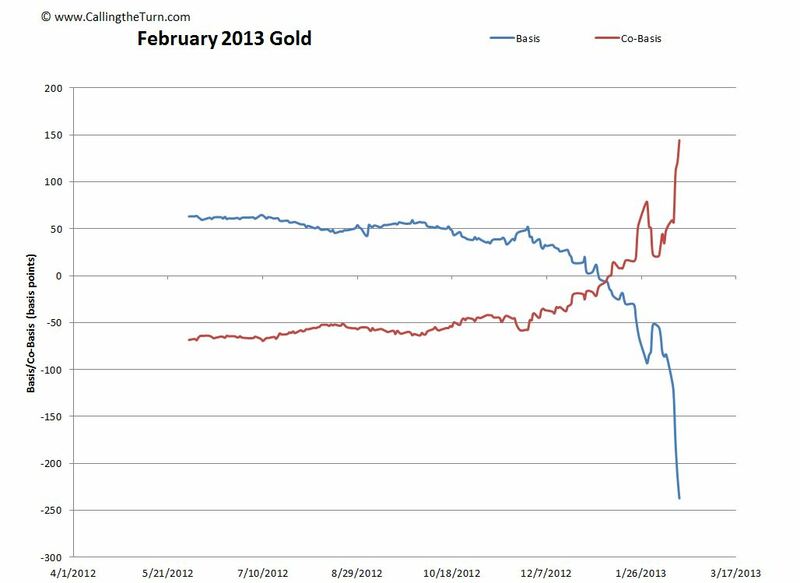 * See here and here the charts of the temporary gold backwardation which occurred from 12/2/2008. 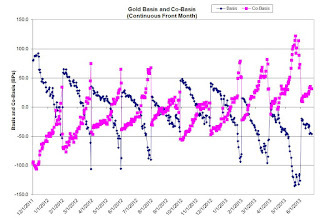 K.Weiner: "Incidentally the rising cobasis heading into each contract’s expiry is a compelling piece of data to debunk the manipulation theories. It shows a relentless selling pressure on the contract. 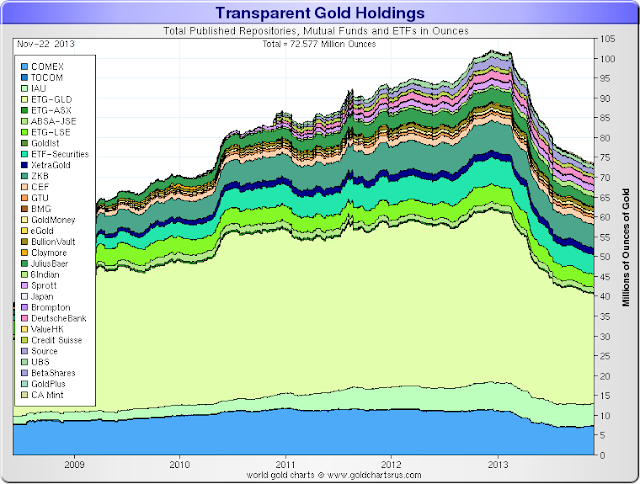 If bullion banks were massively naked short, they would not be selling but buying. 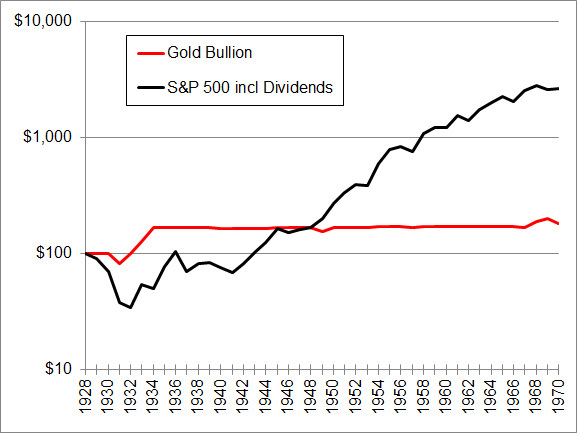 It is speculators. They are naked long, so they must sell before First Notice Day. This pushes down the bid. 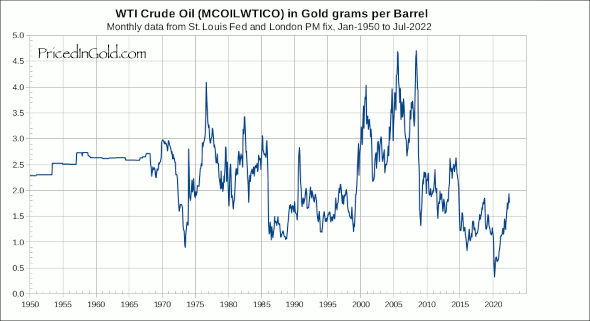 Basis = Future(bid) – Spot(ask). 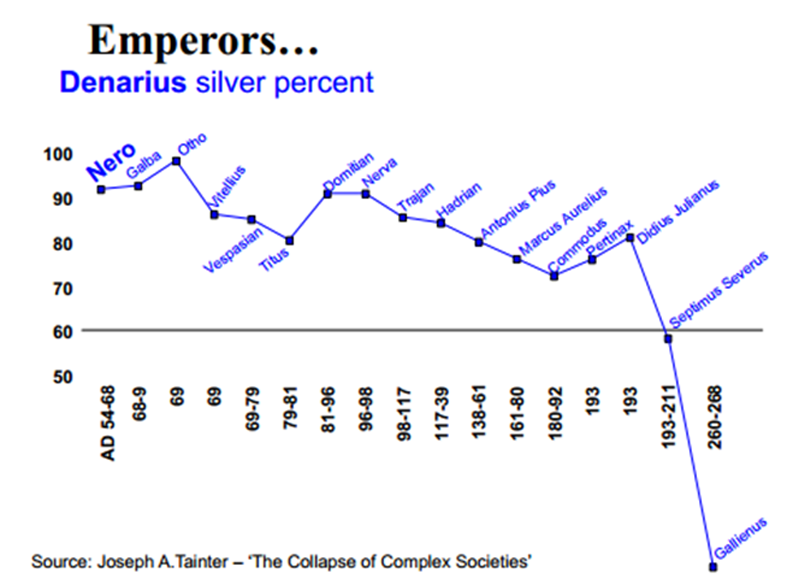 And we do indeed see the collapse of the basis every time. 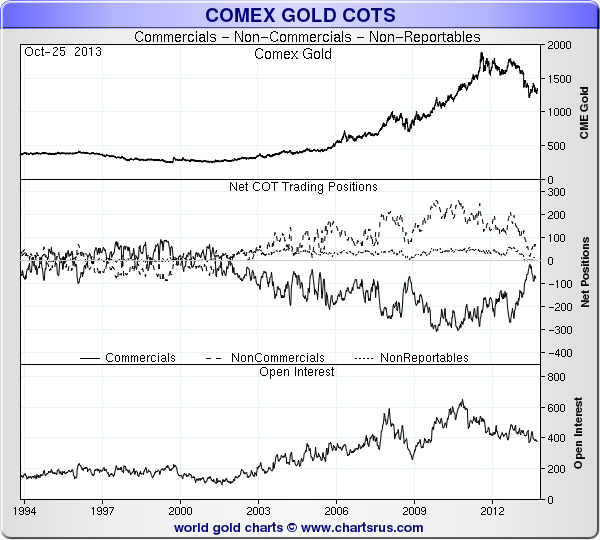 Cobasis = Spot(bid) – Future(ask). When the bid is pushed down, the market makers pull down the ask. However, as a contract heads into expiry we can expect the market makers to be less aggressive as they need to exit their own positions and close their book before First Notice Day as well. 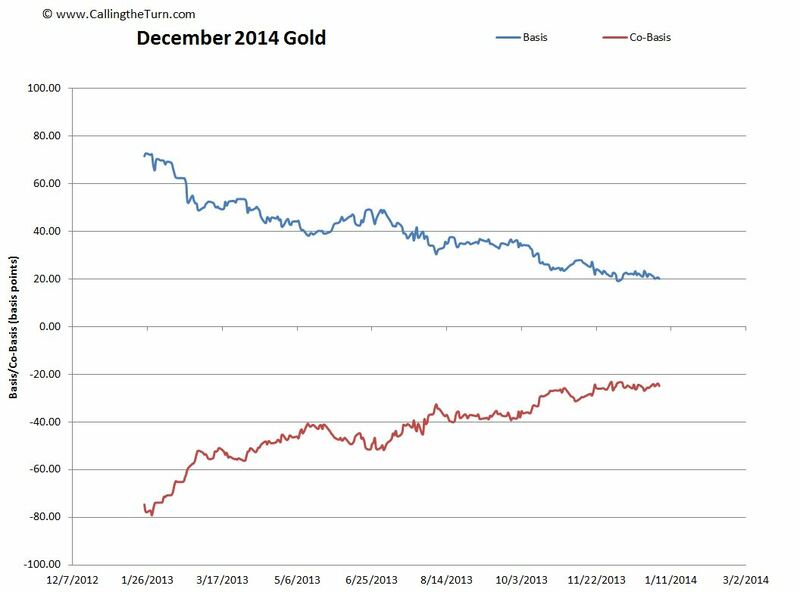 The bottom line is that the basis collapses and the cobasis rises, but more reluctantly." Watch also this video interview. 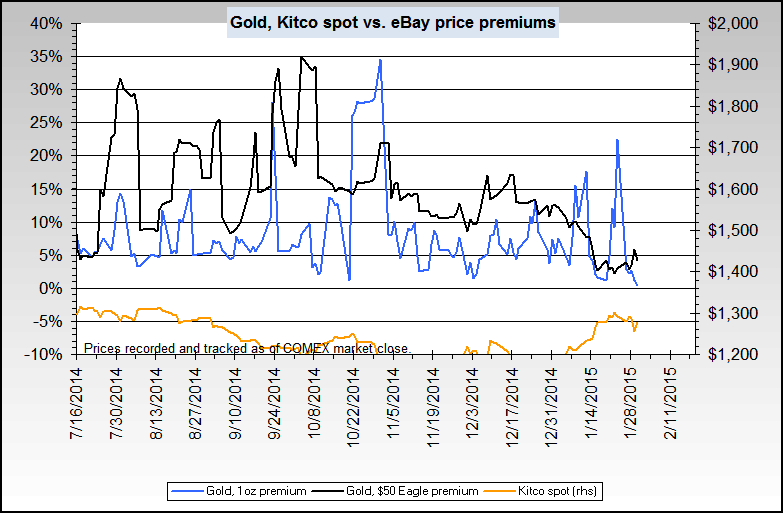 K.Weiner: "Silver bases are much more volatile than in gold. 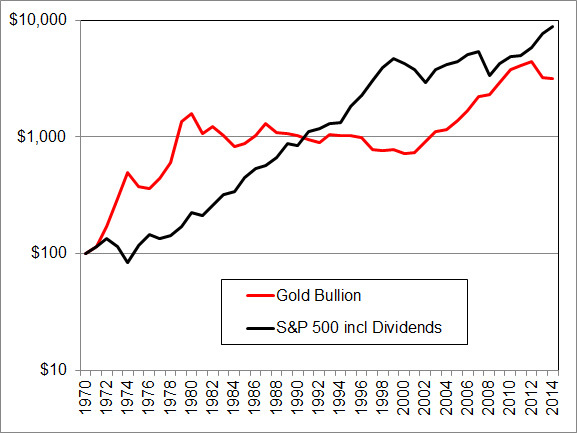 And silver has a much stronger basis distortion field than gold. 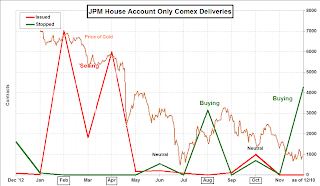 As a futures contract approaches First Notice Day, those who own it must sell unless they have the cash and desire to take delivery. 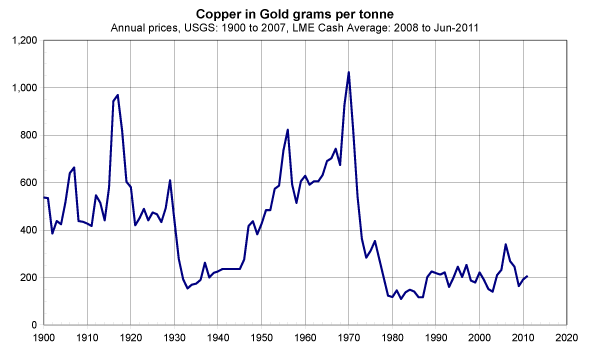 They’re interested in leverage, to make dollar profits on a rising price, and only a small percentage actually want the metal. 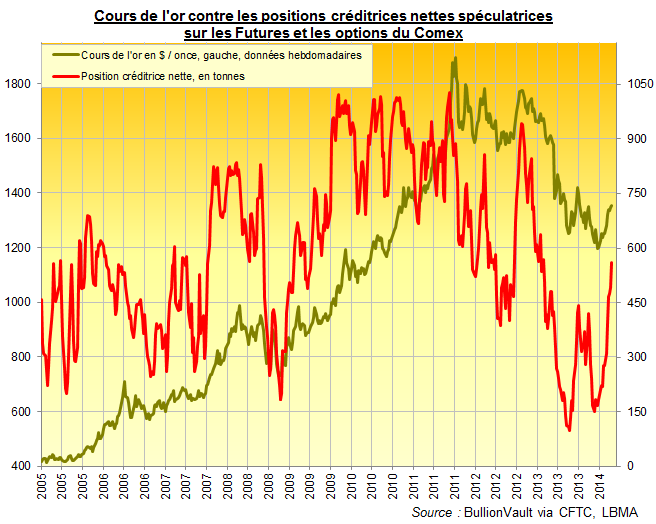 So they must sell the expiring contract and buy the next one. 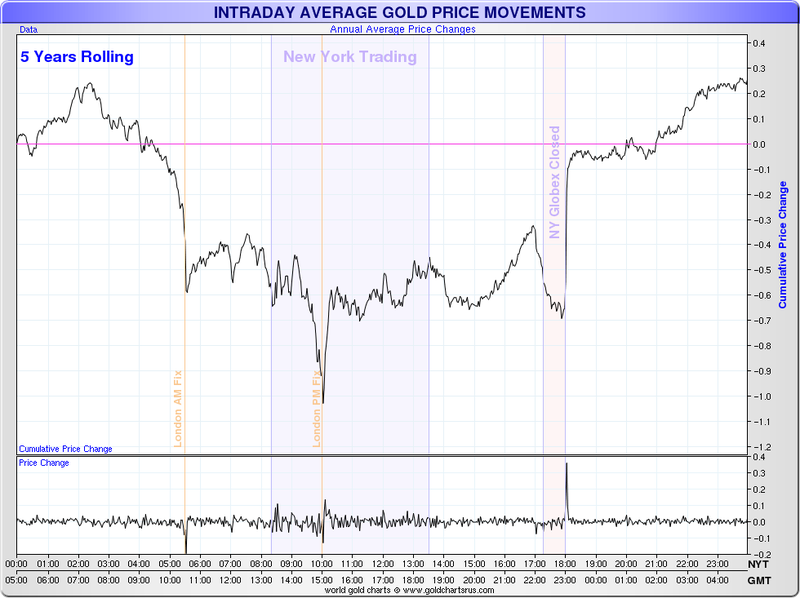 This pushes the expiring contract down, which tends to cause backwardation. This is a distortion, not real signal. It’s an artifact of the mechanics of the market. It is caused by having discrete contracts. 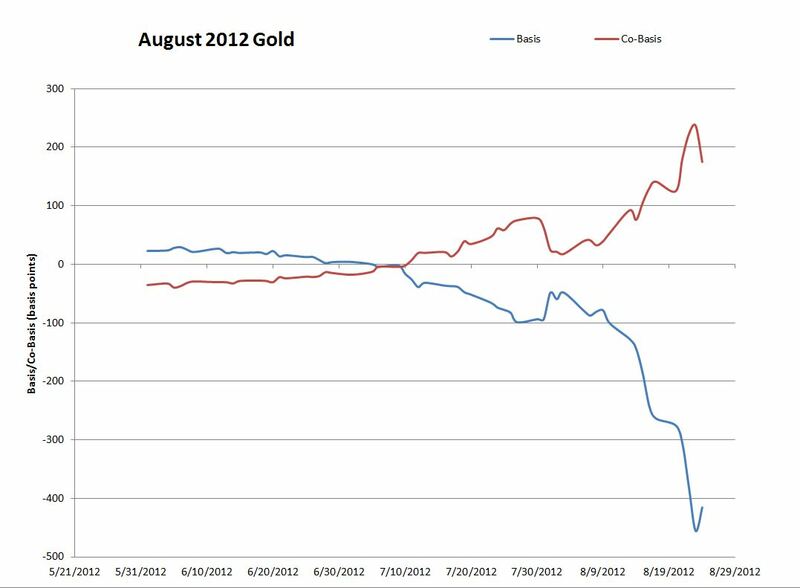 In silver, the near contract tends to be pushed down much more than the near one in gold. 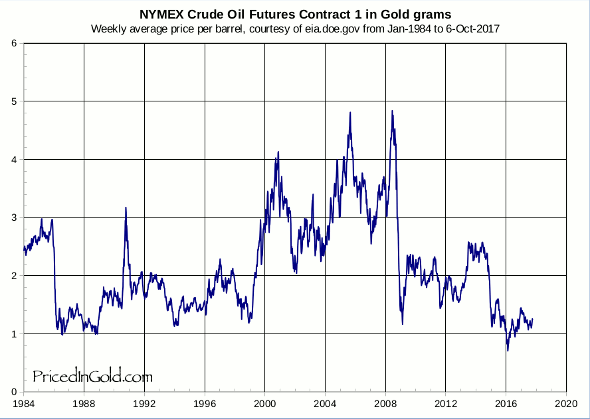 Also, there is often an effect on the next contract out and that contract is also pushed down in silver more than in gold." 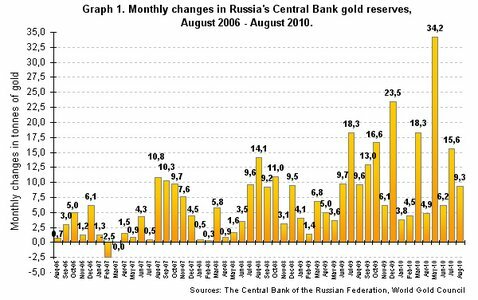 * The duration (number of backwardation days before end of the futures contract) is quickly increasing month after month. 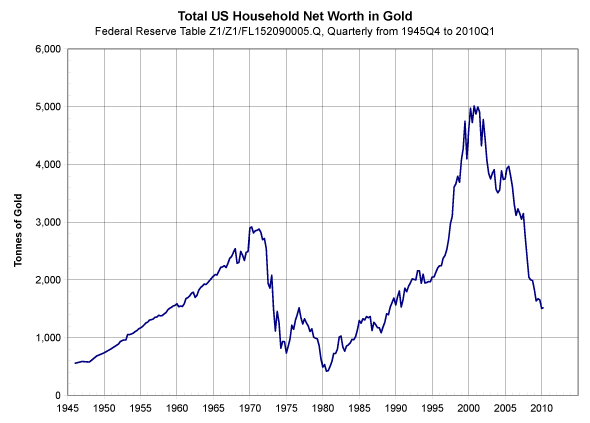 This is the path towards permanent gold backwardation. 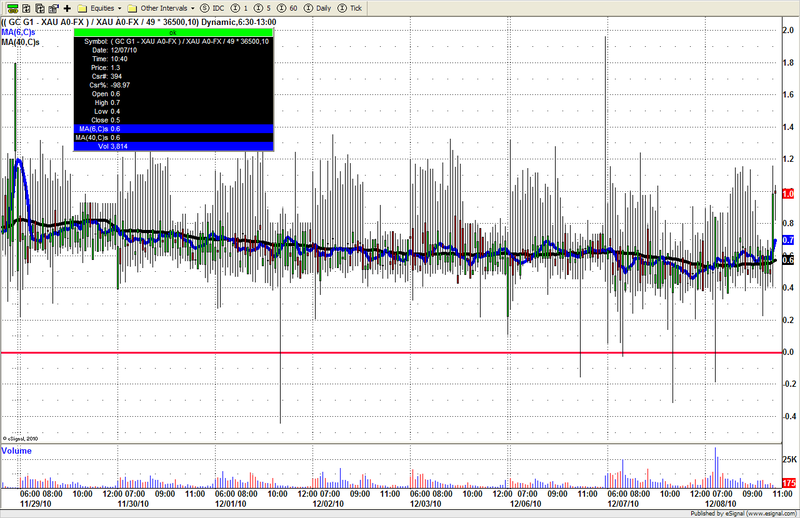 October 2013 futures contract first backwardated July 8, or 61 trading days before October 1. 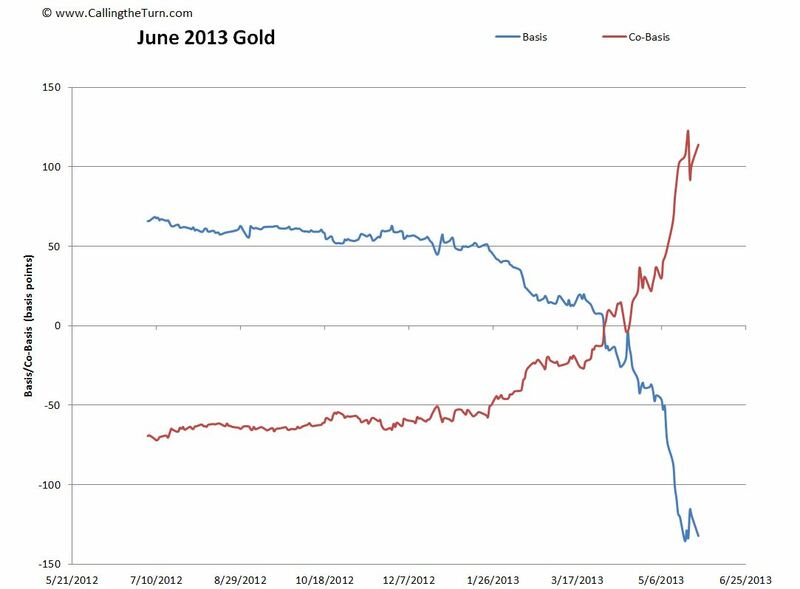 Keith Weiner (7/21/2013): "One should regard rising backwardation as one would regard rising Credit Default Swaps on a [sovereign] bond. 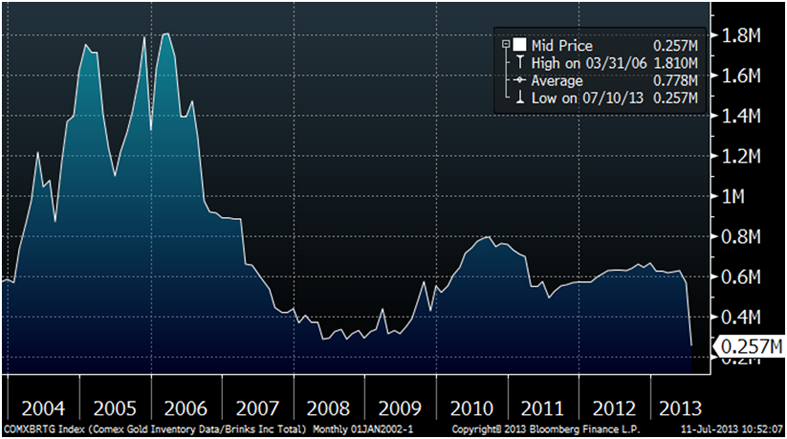 Even if the yield on a bond isn’t rising exponentially (yet), rising CDS should be cause for concern. 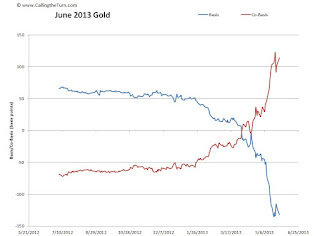 The temporary backwardation in Gold and Silver is like a distortion field; as we move closer to each futures contract expiry, that contract is pulled into backwardation. 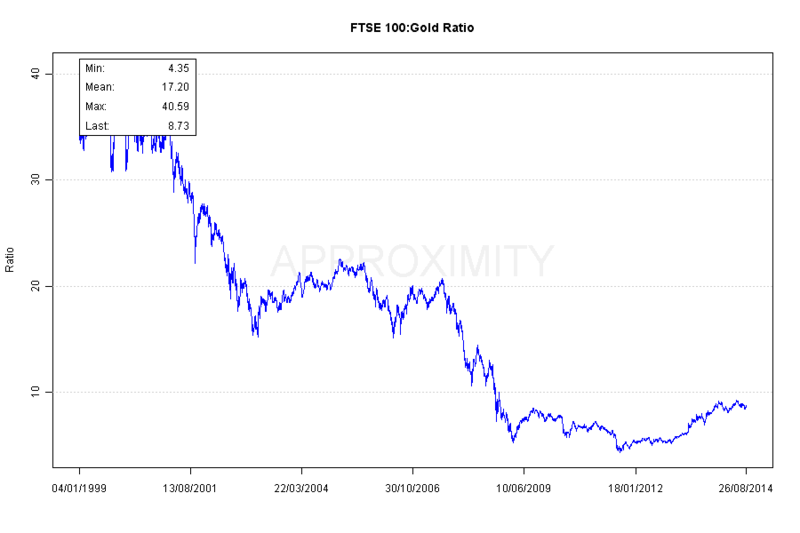 The bid drops, which causes the basis to fall off the bottom of the chart. 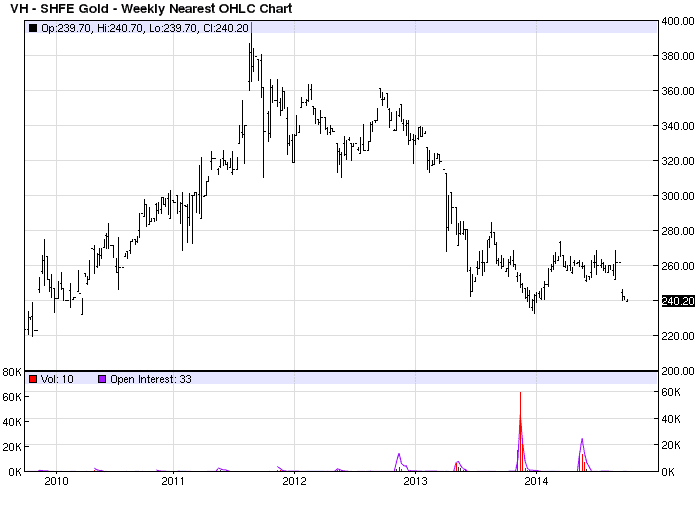 This could be due to heavy selling, as naked longs must sell before First Notice Day (since they haven’t got the cash to buy the metal). Their selling, of course, presses down the bid. But the mechanics of the contract roll does not fully explain the phenomenon. 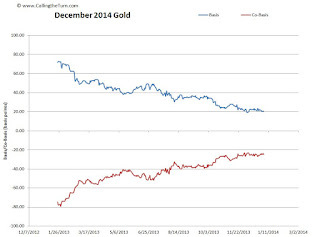 For one thing, the distortion field is wider for silver than for gold. 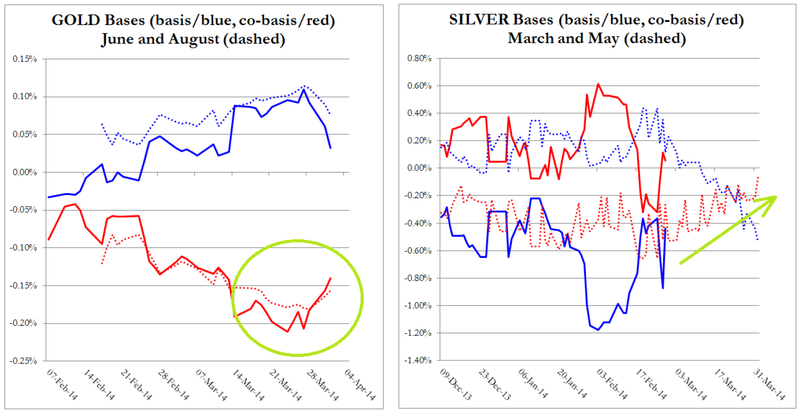 The basis for September silver has been falling in earnest since shortly after the April 15 crash. 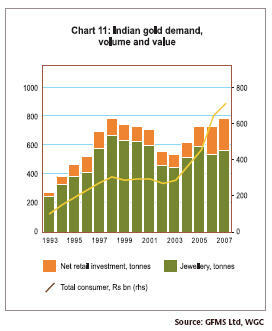 This shows that scarcity is increasing at the lower price. Think of temporary backwardation as rot in the heart of a tree. It can spread for years, undermining its integrity. The collapse of the tree at the end is “unexpected”. 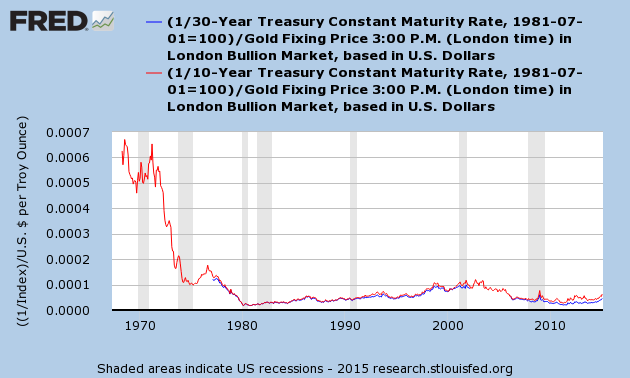 As the financial system rots, people increasingly discount monetary metals for future delivery. 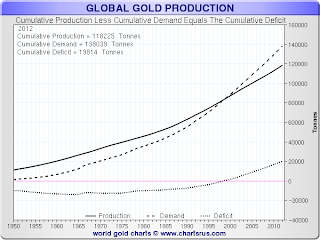 With a rapidly withdrawing offer in spot gold, and at the same time an increasingly reluctant bid especially on far futures, there would be a large backwardation that is greatest the farthest out on the [yield] curve." "Permanent backwardation is when all futures contracts fall below the spot price, and the gap keeps widening no matter how much the price rises." 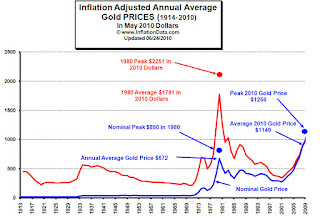 * "Permanent backwardation is when all futures contracts go into backwardation, and no matter what happens with the gold price (probably rising quickly), the backwardation increases. 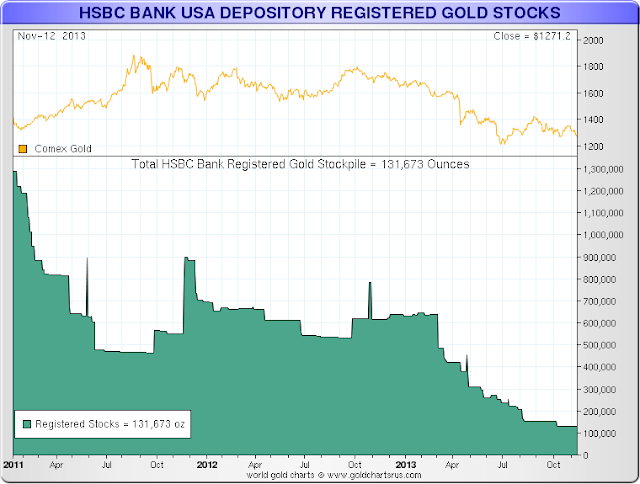 This is the first step of gold becoming unavailable to the market. 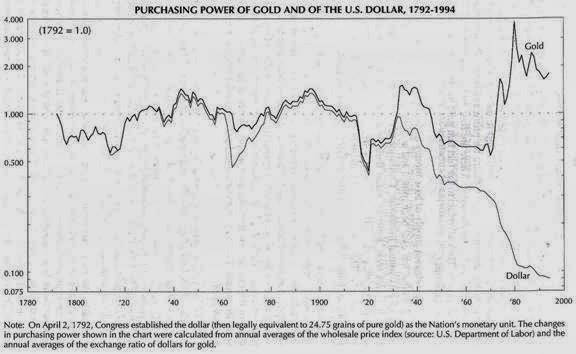 Why should people who own good gold bid on bad paper, once it is obvious that the paper is being dishonored? 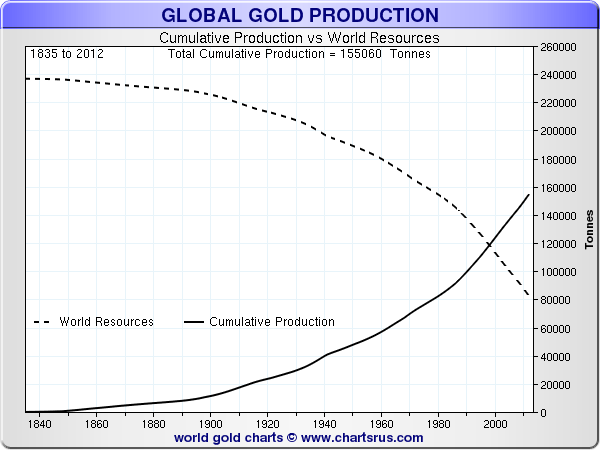 But those who hold paper will still want gold. 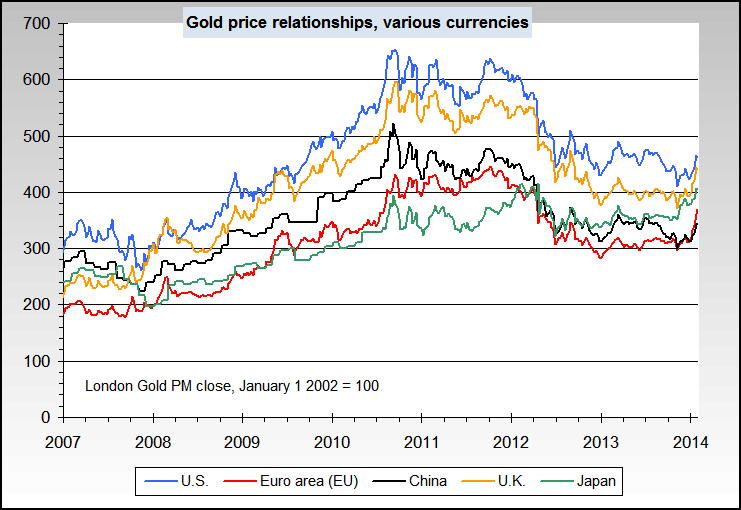 Increasingly, they will trust only gold metal. 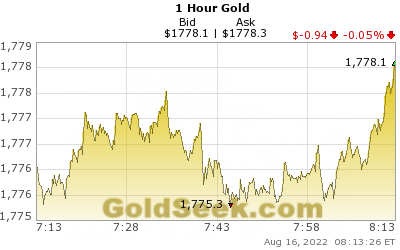 So in the gold futures market, the bid is falling and in the physical gold market, the ask is rising. 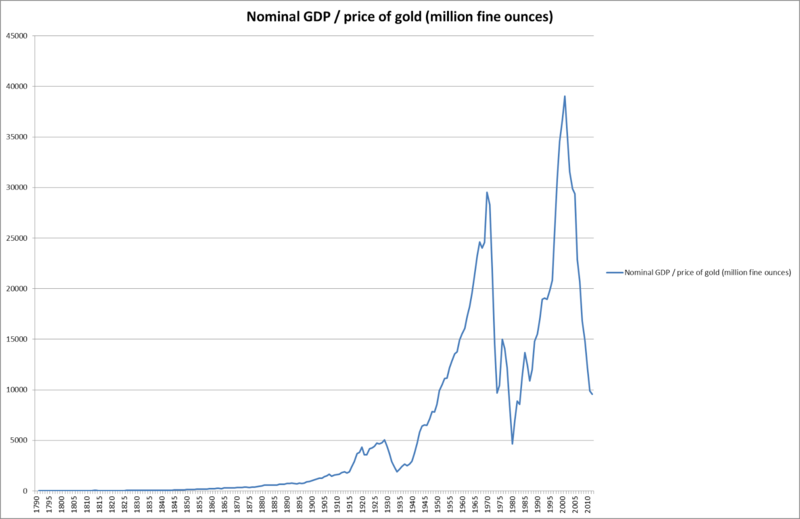 The destruction will come when people discover that so long as they can use their paper money to buy commodities like oil. 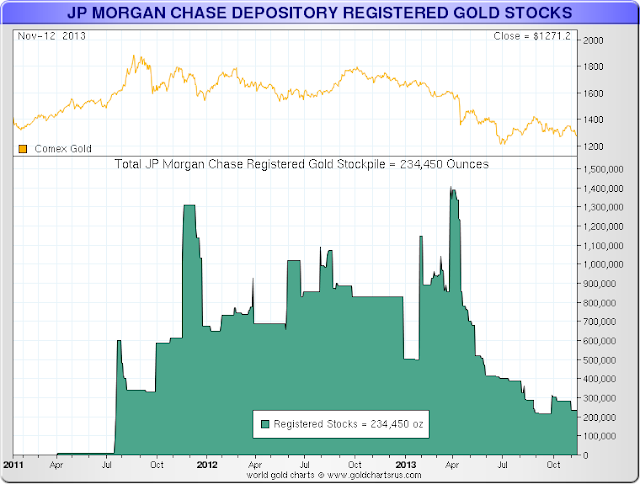 This will give them a back door to gold. 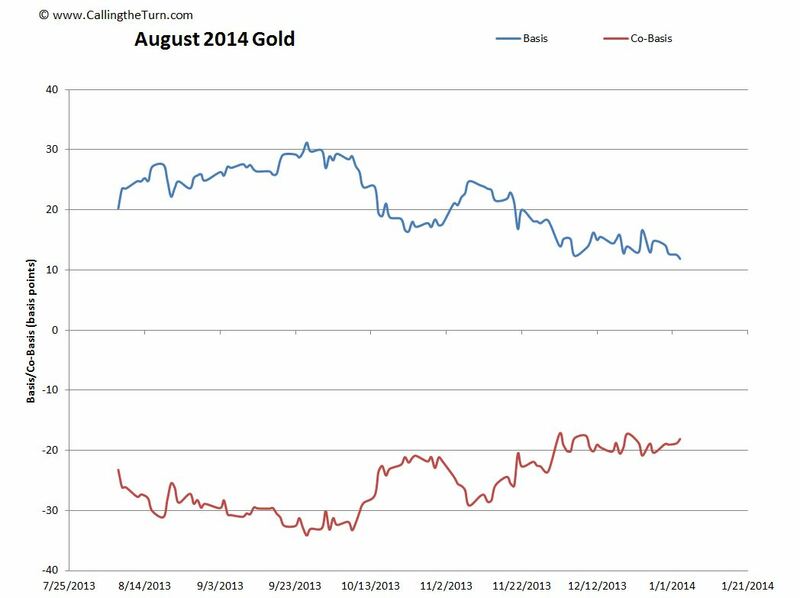 Gold will still bid on commodities, even when it does not bid on paper money. 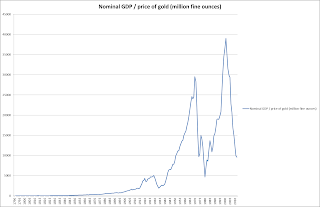 This commodity arbitrage (paper for oil, oil for gold) will drive the price of oil to rise exponentially when measured in paper, and down nearly to zero when measured in gold. And the same will occur for every commodity. 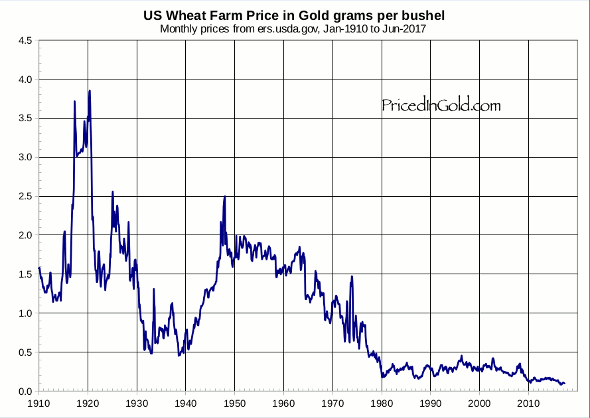 People will call this “hyperinflation” but it will have nothing to do with the quantity of money, nor will it be driven by consumers competing with one another to buy bread with wheelbarrows full of paper money. 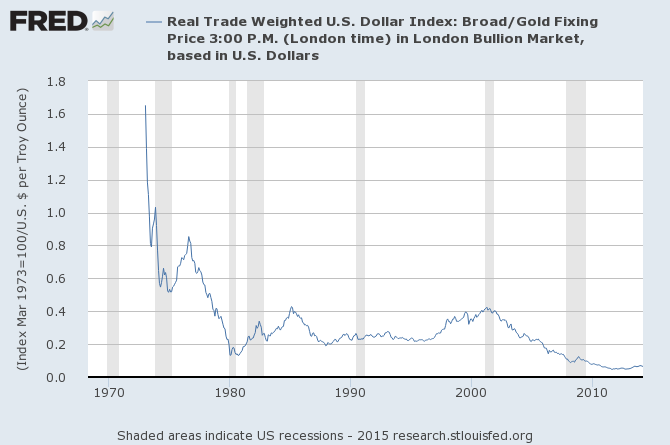 It will be the last chance to trade paper for a little gold, and the end of the paper currencies. We should look for the following signs. 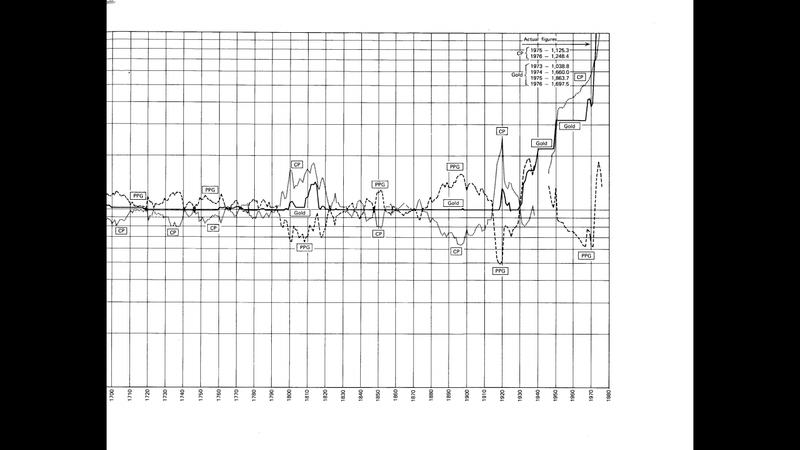 The interest rate on the long-term bond approaches zero (which means the Net Present Value of the debt approaches infinity). 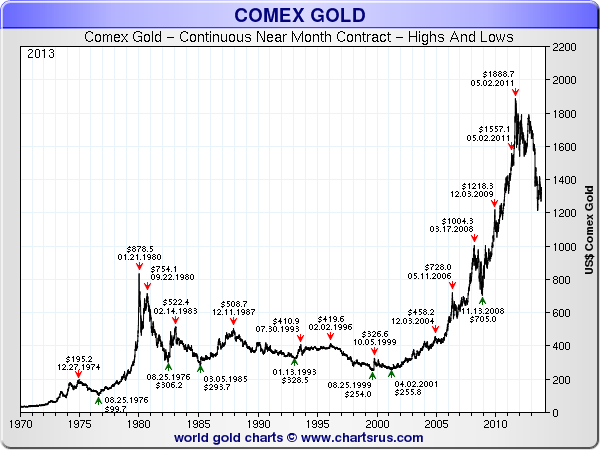 The gold price is rising exponentially, especially if the cobasis is rising across all contracts. The duration of government bonds held by the public is approaching zero (people are unwilling to take the risk of holding long-term debt). 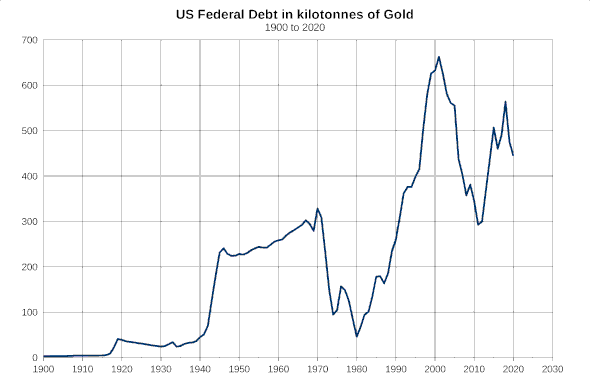 All net new issuance of government debt must be purchased by the central bank. The central bank’s balance sheet becomes filled with illiquid, long-term assets at overstated values, and people call it into question and judge it insolvent (when people withdraw their trust of the bond, they will not jump out of the frying pan and into the fire by trusting the paper currency backed by the bond). 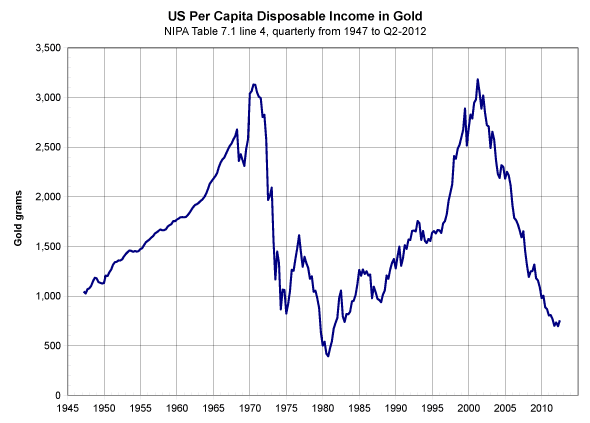 And real capital is being destroyed, with rising bankruptcies, many of which are unexpected (like Bear Sterns)." 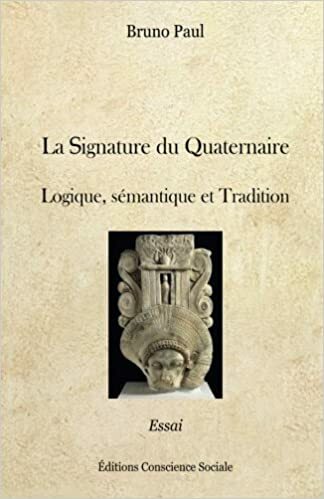 Source, 08/12/2013. 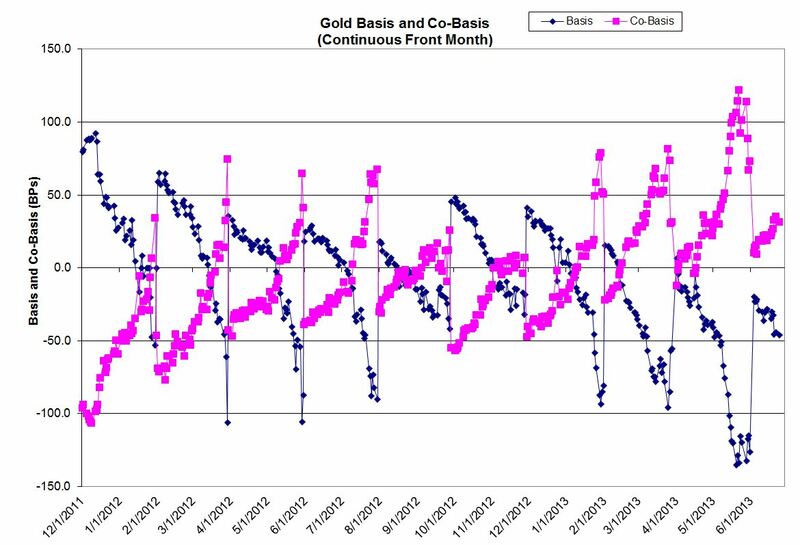 Norcini: "trying to construct a gold basis chart is a bit difficult to do. 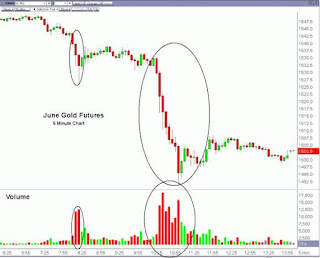 One of the reasons is because the basis, which as Antal correctly defines as the difference between the front month futures contract and the cash or spot price, must be defined at the exact same moment in time due to the wicked volatility of the futures market. 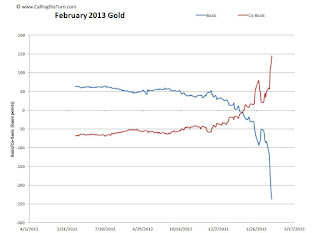 The gold futures market generally is moving much faster than the spot price of gold. 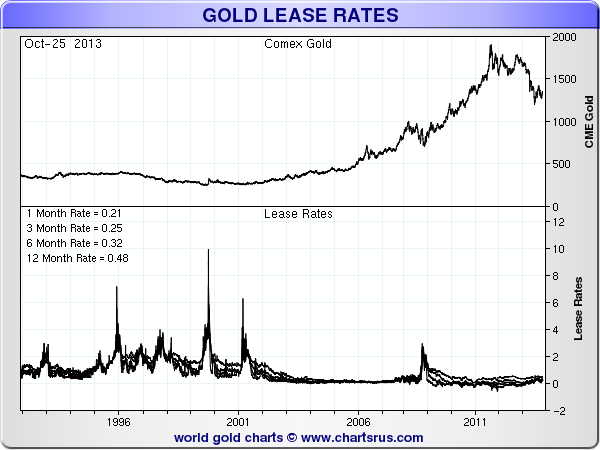 To get an accurate reading of the gold basis then is very difficult at times due to the lag. 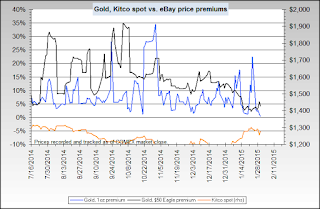 Some of you might have noticed this when you have been recently making purchases of gold and are getting a spot price off of a web site such as Kitco and looking at the futures market price. You can see the difference." 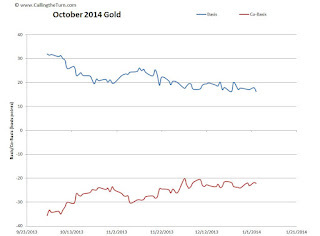 * GOFO (Gold Forward Offered) rates are the rates at which dealers will lend gold on a swap against US dollars. 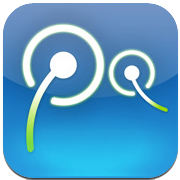 Most of the previous content of this section has now been moved into this article. 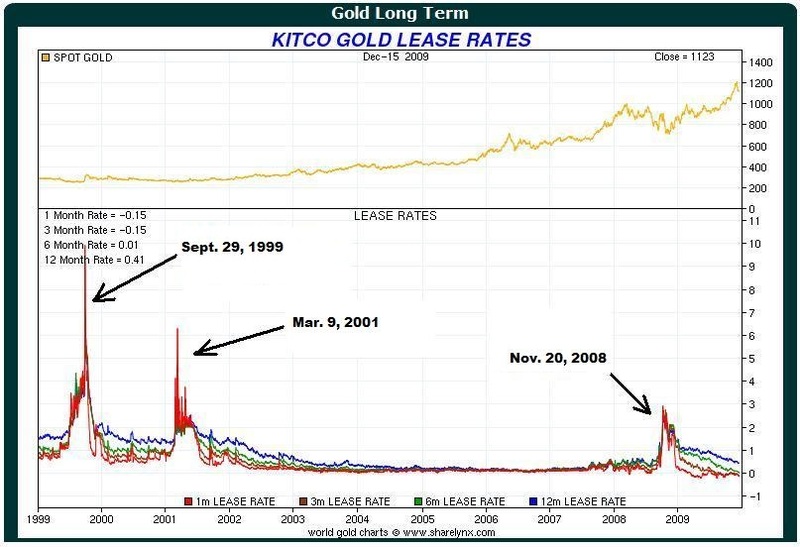 Derived Gold Lease Rate = LIBOR minus GOFO. 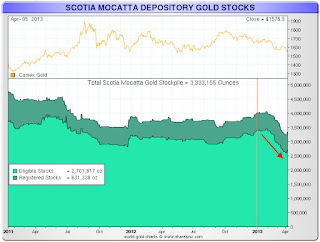 GOFO rates and "Paul's channel"; data series from 01/01/2010, with zoom till 12/19/2013; LBMA data compiled by conscience-sociale.org; This chart is updated monthly on our original article's page. 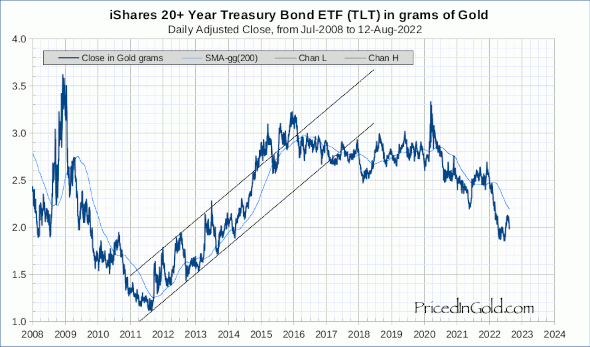 From this trend, we can anticipate when 12-month GOFO Rate will become negative (cf blue downtrend channel above, with dash line). 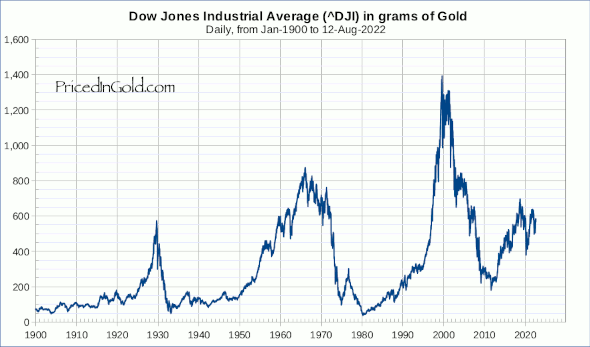 It will be the second time since the opening of gold futures (or Gold forward) market. 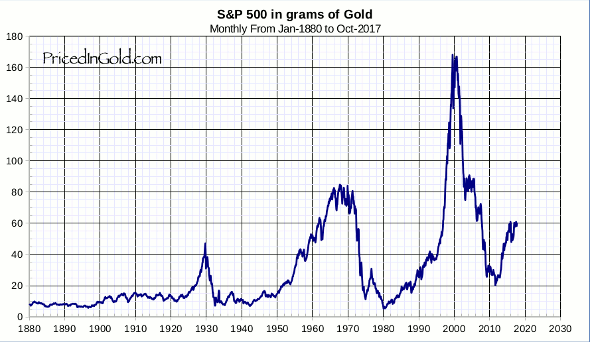 I've discussed this anticipation in this article published some months after a first version of this chart went online on our Gold Basis page. 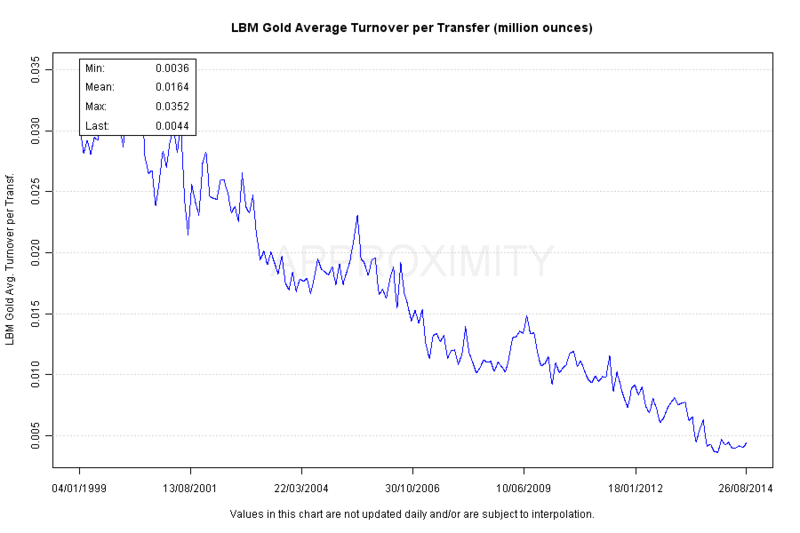 If the FED/BoE would try anything (to cut or accelerate QE3, to make the price of LBMA fixing gold or LIBOR to peak or fall...), the upper limit of this time frame will be even shorter because downwards trend will accelerate. 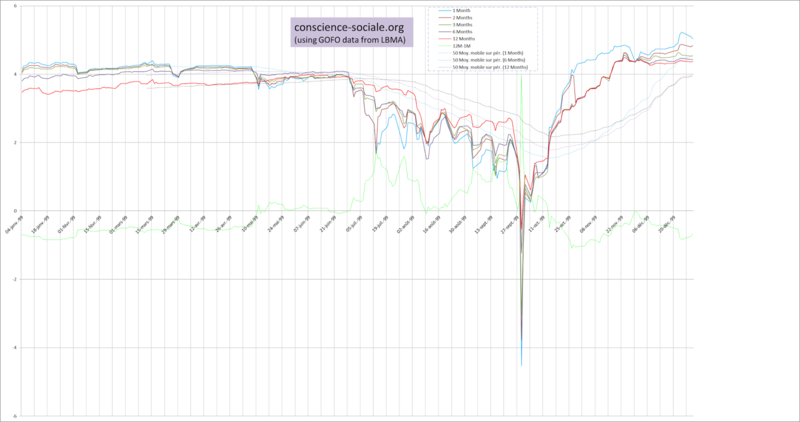 GOFO 1M, 2M, 3M, 6M rates turned negative between 7/08/2013 and 9/12/2013 almost continuously. 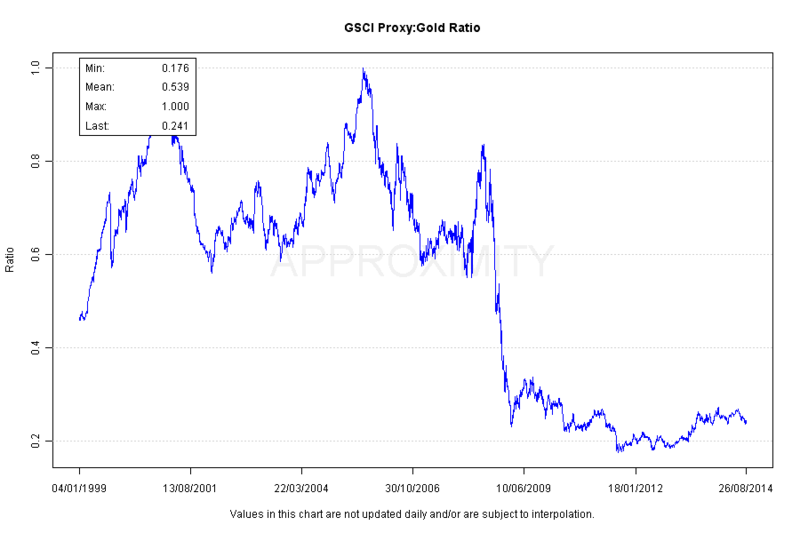 Since inception 07/1989, GOFO rates turned negative only 3 times before 2013, but never so long. 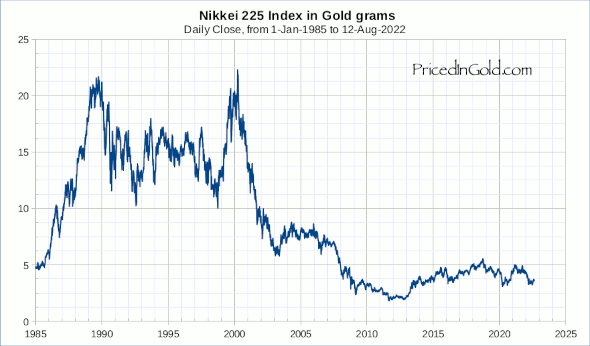 We should note the 1999 gold crisis did not happened only for 2 days. 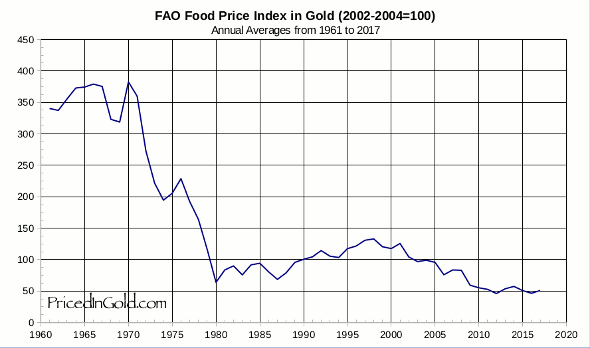 The GOFO chart for this year depicts this clearly: observe how the GOFO 1M-12M spread evolve between Sept. 97 and Dec. 99. 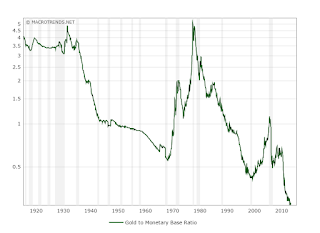 - and the last: why were the values of GOFO 12M-1M negative between the beginning of the public record 1989 (except for some days of gold crisis) and April 2004, and did not evolve according to the spread LIBOR 12M-1M? 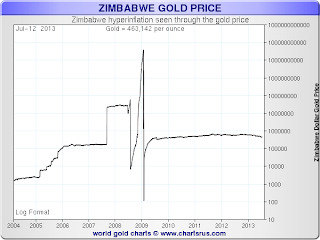 What is the relation between Gold Basis and GOFO rates ? The answer is basisGOFO. 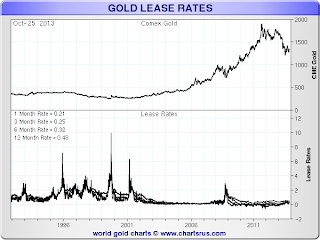 GLOR (Gold Lease Offered Rate) est la moyenne pondérée des taux d'intérêt auxquels les participants du marché sont prêts à louer des lingots d'or qu'ils possèdent. LIBID (London Interbank Bid Rate) est la moyenne des taux d'intérêt pendant la nuit, au cours de laquelle les banques sont prêtes à accepter des dépôts d'autres banques. 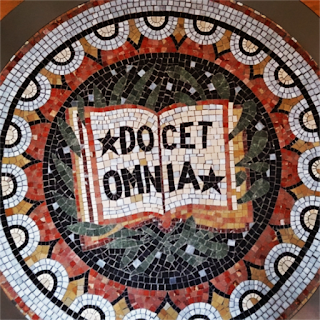 Il est publié en même temps que le LIBOR. 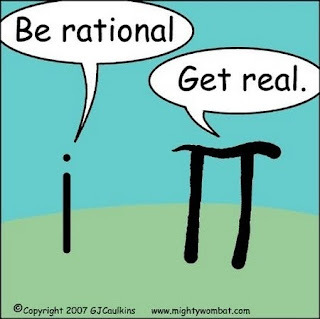 On peut alors calculer cobasisGOFO = LIBID - GLOR = LIBOR - 0,125 - GOFOmoyen + 0,1 = basisGOFO + 0,075 c'est à dire une simple relation de translation, conséquence des approximations que nous avons prises ici. 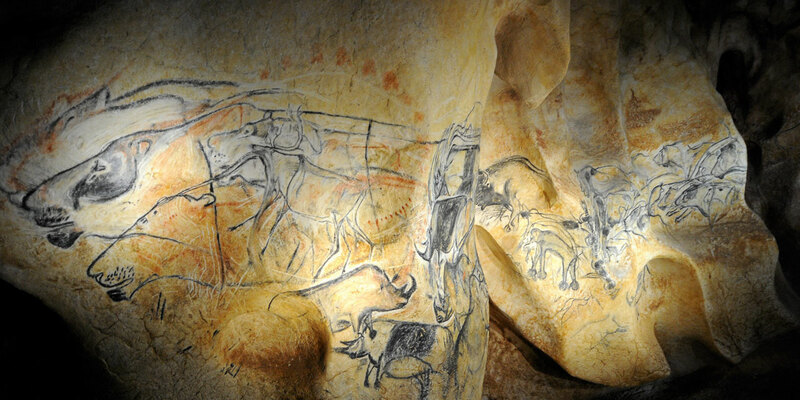 Si on dispose d'un accès à un historique des valeurs LIBID, GLBR, GLOR on peut alors déterminer précisément l'évolution actuelle de (co)basisGOFO en période de crise du marché. 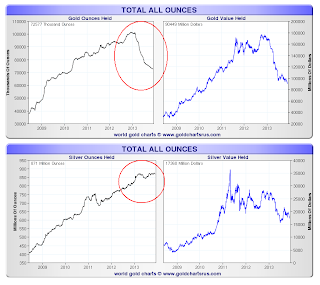 In 2010, the top 3 commodity exchanges that trade gold averaged $24.3 b. in daily gold trading volume (or 19.8 M. troy ounces). 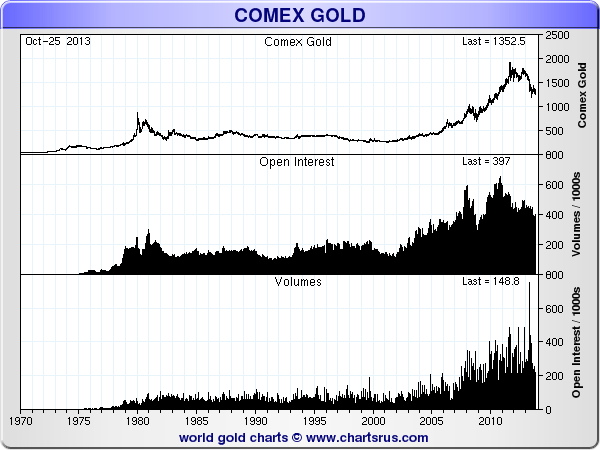 COMEX began to offer trading in gold futures contracts in 1974. More than 70% of all gold futures volume are traded on COMEX, where gold futures contracts exchange was launched on 31 December 1974. Tokyo TOCOM has been trading gold since 1982, India MCX since 2003. 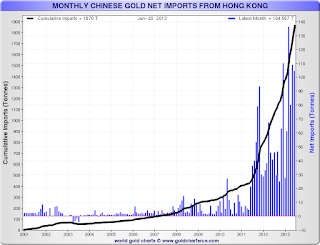 The Shanghai Futures Exchange (SHFE) introduced gold futures contracts to the Chinese market 1/9/2008. 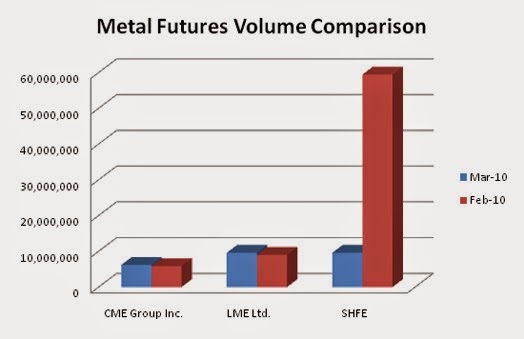 With NYSE LIFFE Exchange they are the next largest exchanges with trading metals futures, and are followed by many smaller exchanges around the world. 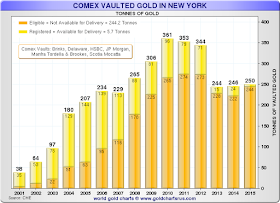 CME Group has a relatively small market share of metals futures, but as of 03/2010 a dominant control over 100-ounce gold sold at the COMEX, a division of the CME subsidiar, New York Mercantile Exchange. 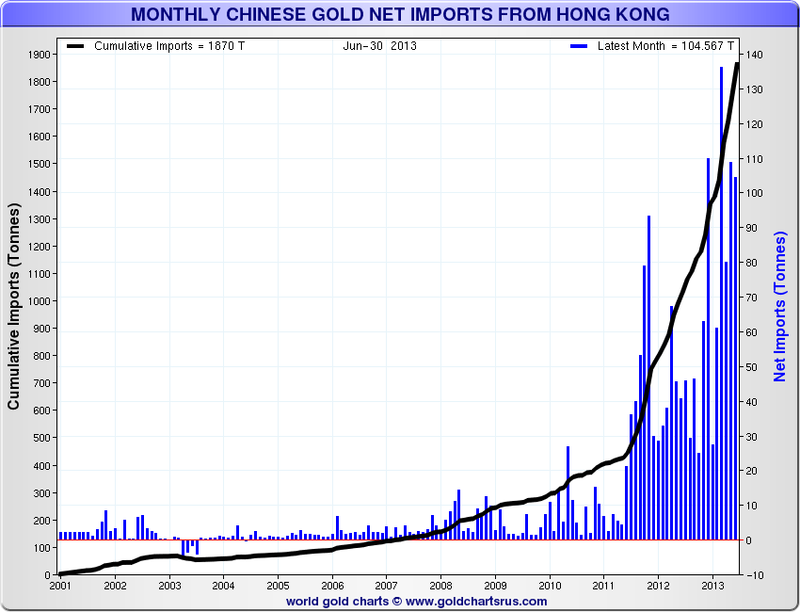 In March 2010, it traded 4.4 million gold contracts, a total of 13.6 million kilograms. 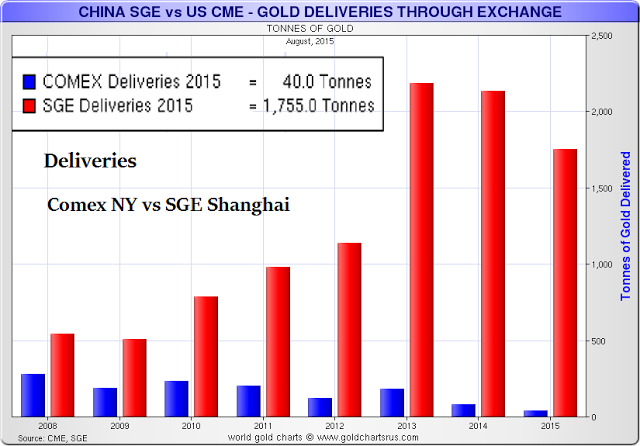 In contrast, Shanghai traded approximately 49,000 kilograms. 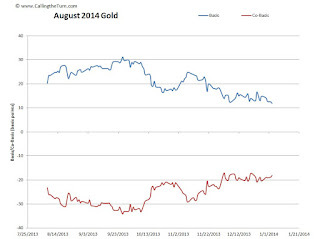 NYSE LIFFE has an even smaller U.S. market share of gold futures. It posted a 1.28 percent market share in the same contract last month. 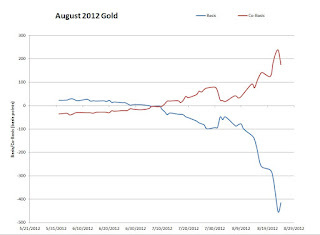 Sep. 2012 SHFE has reported the first physical delivery on a silver futures contract through its own platform. 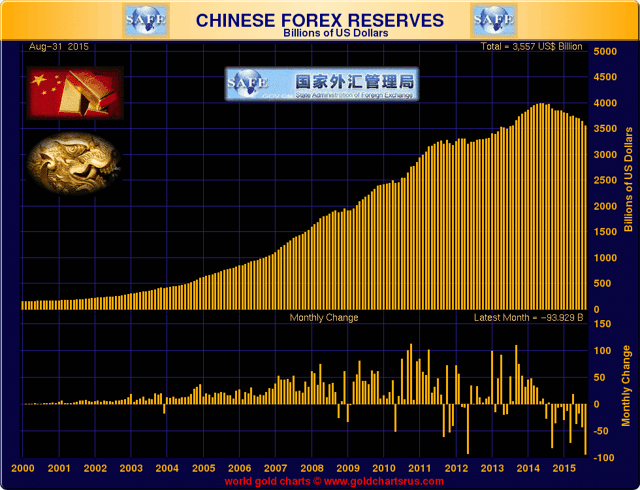 April 2012, the silver futures were introduced as an alternative investment instrument for China’s private investors, and to allow China to influence the global silver price. 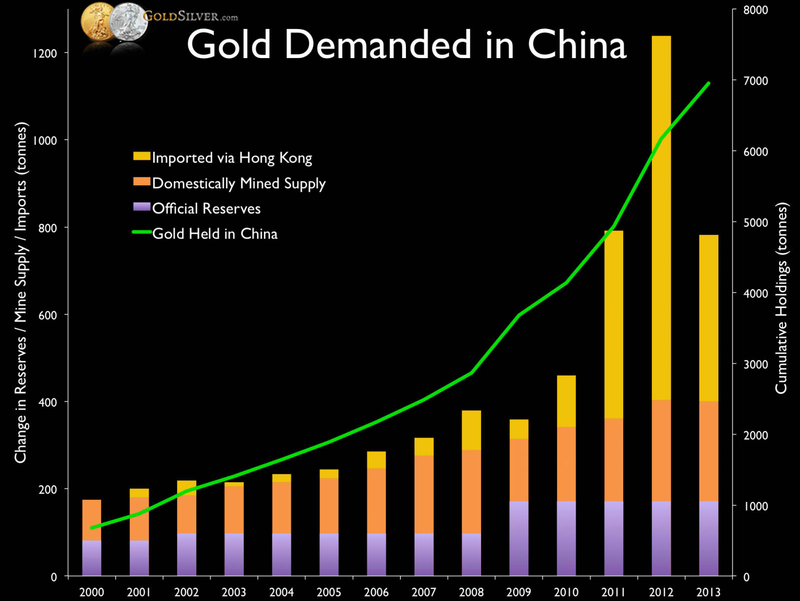 China is the world’s largest silver producer after Mexico. 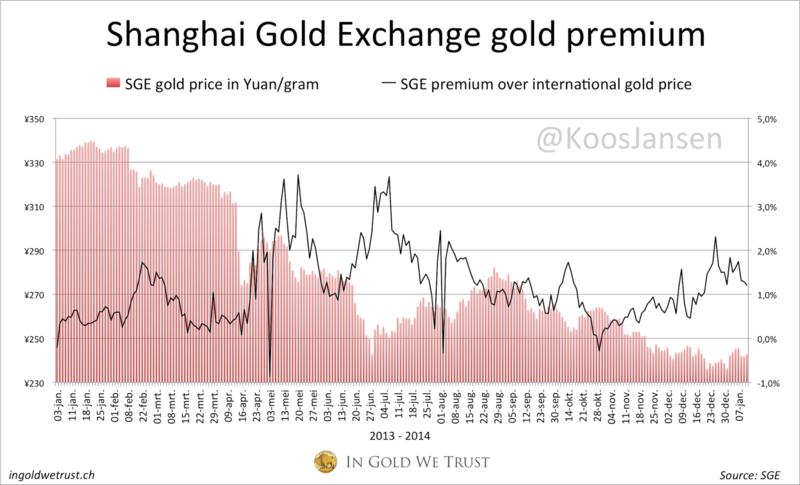 9/18/2014 SGE opened of the International Board of gold traded in yuan. 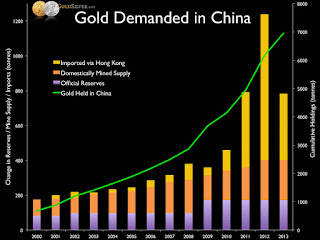 China is the world’s largest gold producer and consumer. 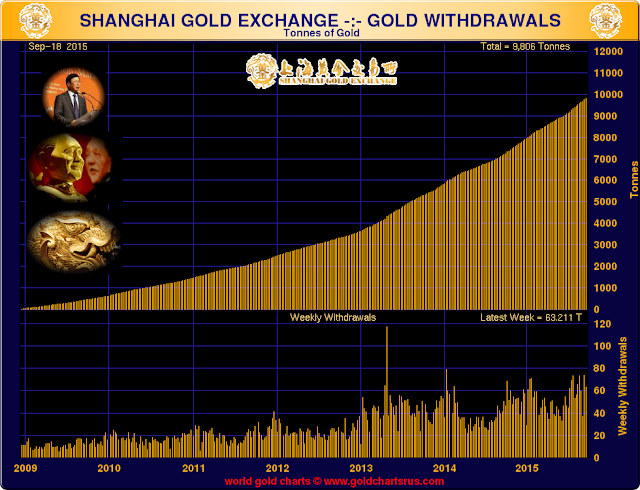 SGPMX is the world's first precious metal exchange opened that is fully backed by physical precious metals. 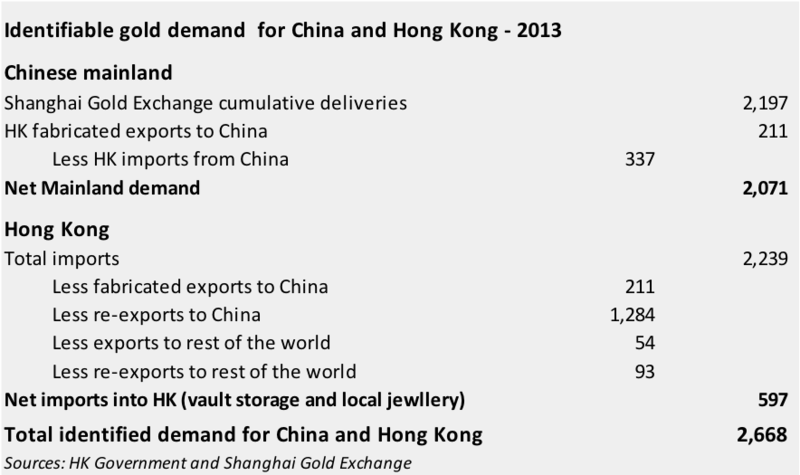 The SGE currently (09/2014) has a network of 58 Certified Vaults (of which 55 are for gold storage and three are for silver storage) in 36 cities nationwide covering all major gold refinement and consumption regions, providing physical delivery, transfer, logistics, and transport services to enterprises and individuals across the country. 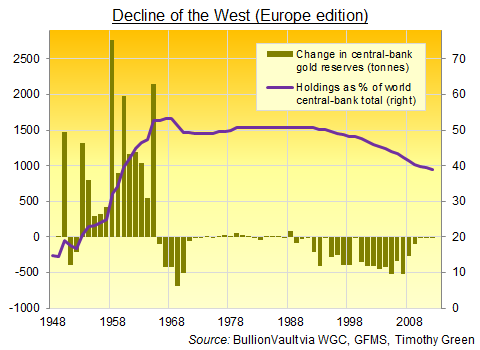 Meanwhile, International Board Certified Vaults provide additional services relating to the transshipment of physical gold bullions between two foreign trading parties. Read SGE rules (article 40) for how the transaction price is determined. 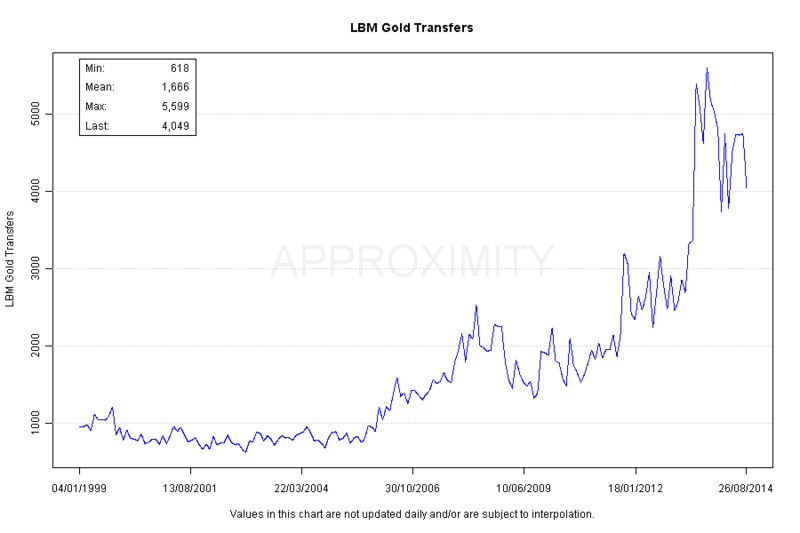 In addition to the fixing prices, two-way gold spread prices are offered by members of the LBMA during each trading day. 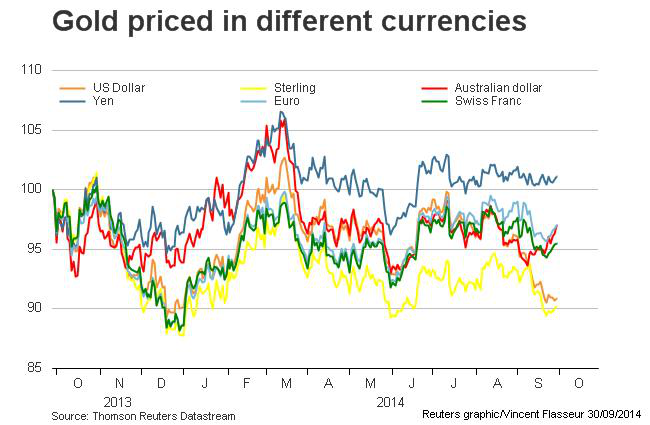 These spread prices include a low (bid) prices and a high (offer or ask) prices. 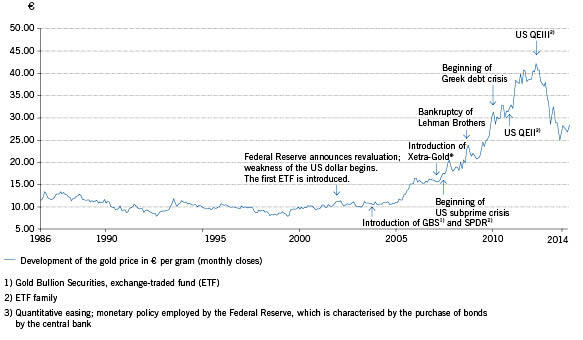 * 'Gold prices' below are only paper gold prices (ETF contracts and options, except otherwise indicated). 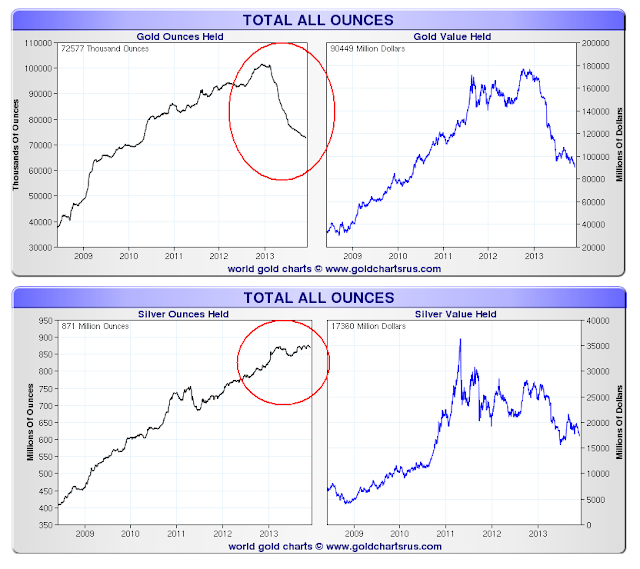 Since the gold market (rigged) event 04/15/2013, (small) buyers&sellers of physical metal in western markets are using different prices with much higher premiums than before (chart below). 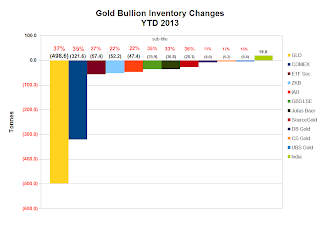 GLD SPDR stockpiles : daily report (rhs); On 1/7/2014 this amount was 794.62 t.
CME Group Globex gold futures ; updated daily ; For Globex, the Price column displays the price at which the transaction occurred. 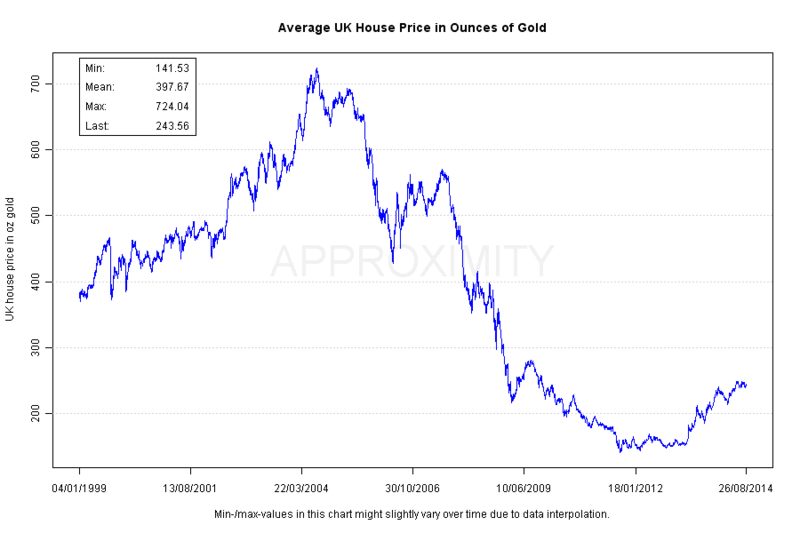 Some prices are followed by an "A" after the price indicating an offer or ask price which occurred at or below the previous last. 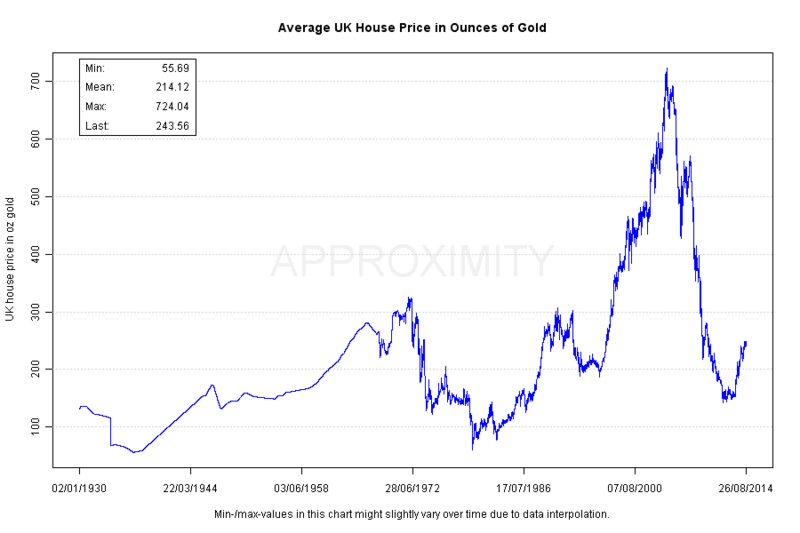 A "B" after the price indicates a bid which occurred at or above the previous last. 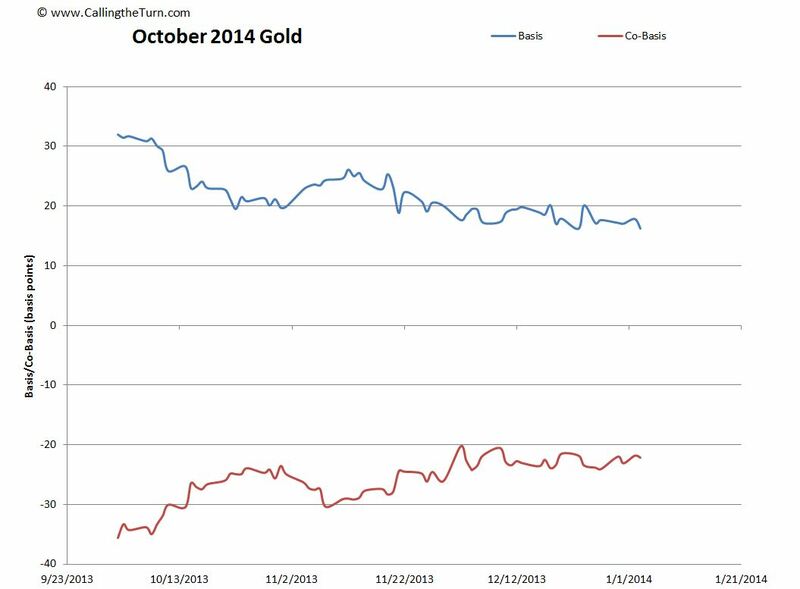 Monthly Bank Participation Reports include COMEX gold futures positions. 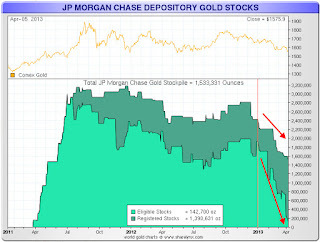 You must read this analysis from Tud Ferguson about JPM Net Short to Net LONG huge number of futures. 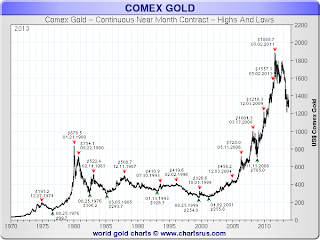 First, take notice of the disclaimer added since the first days of June 2013 about CME reported gold and silver stocks (see below). Turd Ferguson has a very good article about very highly dubious records (official explanations are "an insult to the reason"). 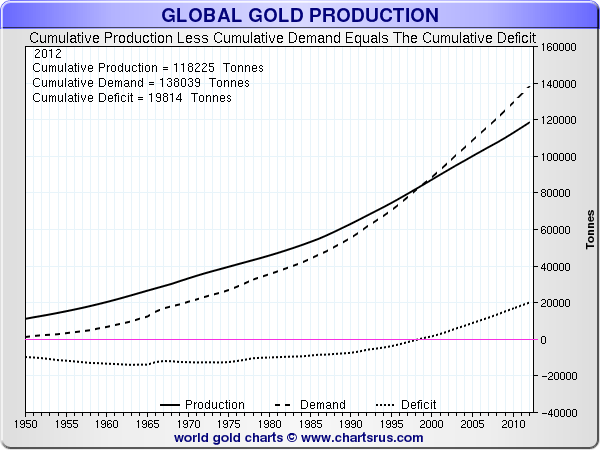 Read the charts accordingly. 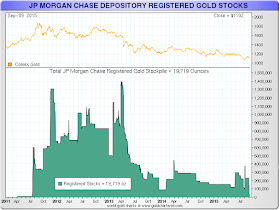 The information in this report is taken from sources believed to be reliable; however, the Commodity Exchange, Inc. disclaims all liability whatsoever with regard to its accuracy or completeness. 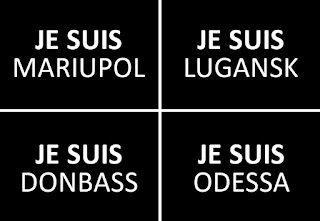 This report is produced for information purposes only. For a particular refinery to deliver metal onto the commodities exchange, it must be a registered acceptable brand, such as Heraeus, Johnson Matthey or Metalor Technologies to name a few. 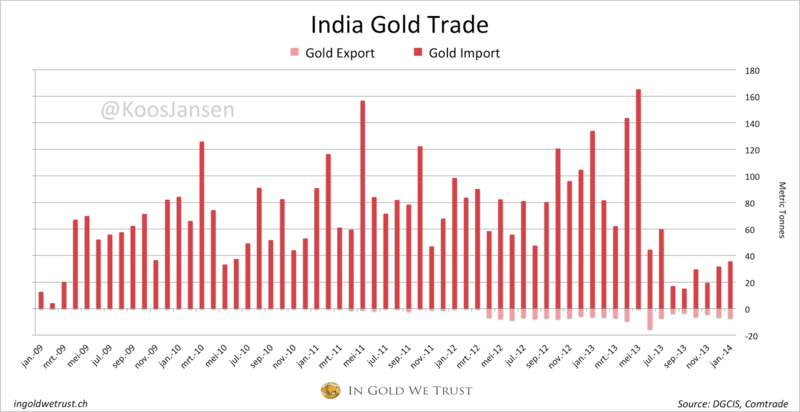 Once these gold bars are produced, the metal must then be transported to the warehouse by exchange-approved carriers such as Brinks Inc., Via Mat International or IBI Armored Inc. 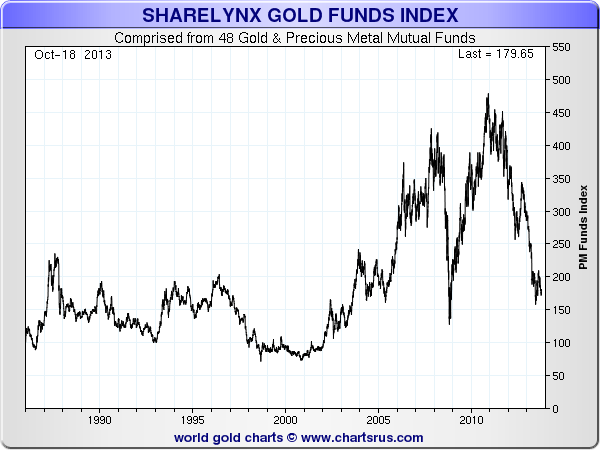 There is no other way for the gold to get onto the exchange. 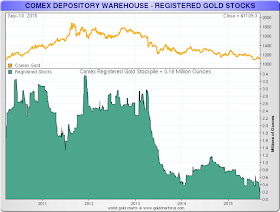 Gold may move between Comex-approved warehouses, such as those operated by HSBC Bank, Brinks Inc., and Scotia Mocatta Depository. But any moves made between these warehouses must be made using the same approved carriers. 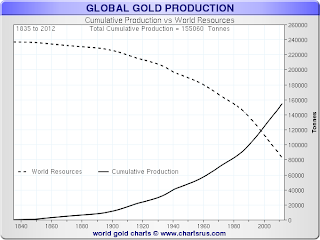 No gold can enter the marketplace from outside of this refining loop. 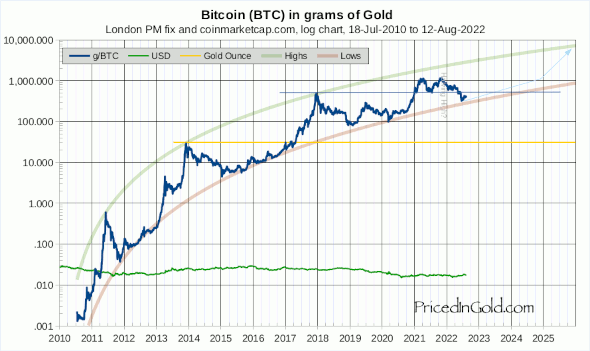 Once gold is removed from an exchange-approved warehouse and held somewhere outside of this circle of integrity, there is no way for the CME exchange to guarantee the bar's quality. This means that once a person or investor removes bars from the warehouse, then to return them to the exchange they would need to start at the beginning again. By going through the hands of the gold processor and refiners, this provides guarantee of the standard and quality of the material being delivered on the exchange. 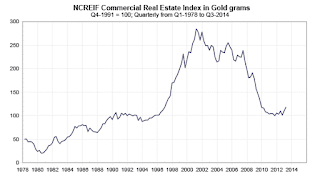 So with the gold inside the warehouse, second question: When is the gold considered eligible or registered on the commodities exchange? 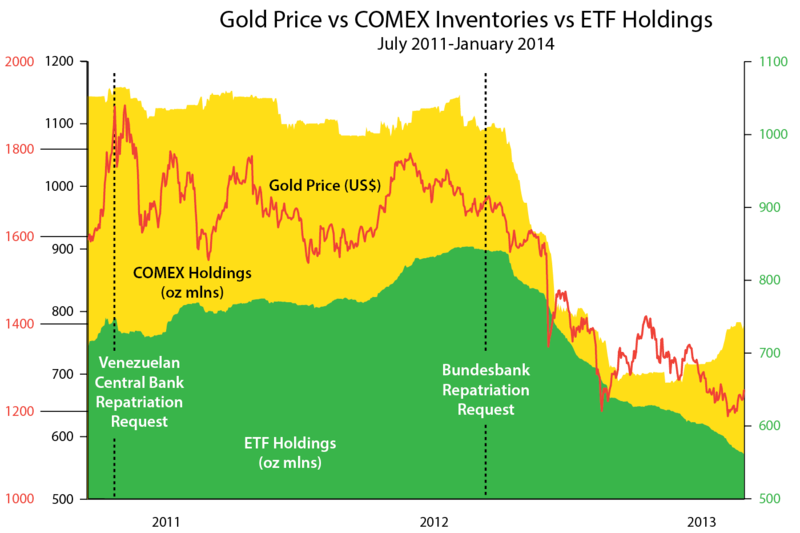 Answer: When acceptable bars are brought into an exchange-approved warehouse they become "eligible" for settlement of gold futures contracts traded on the exchange. So at this point, the owner of the bars may deliver them onto the exchange, and warehouse receipts are created. 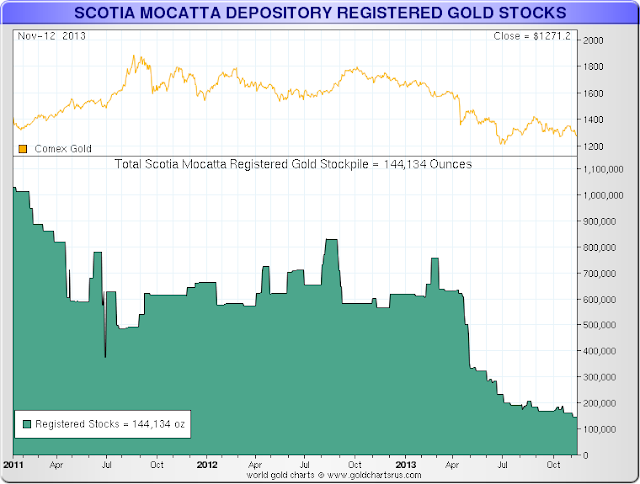 That is when the gold bars become "registered" stocks. 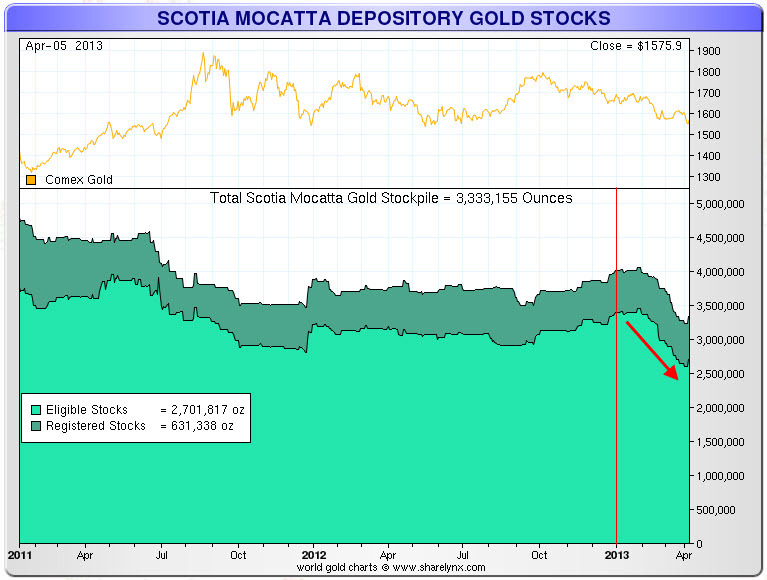 Eligible gold stocks may or may not ever become registered stocks. Why? 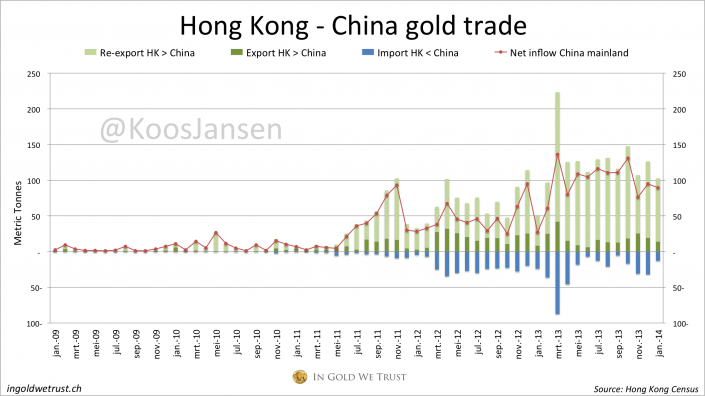 Because the warehouse is still a warehouse and the owner may simply want to vault their metal securely, before using it to meet demand elsewhere – for manufacturing, or from investors in another marketplace, such as Asia. 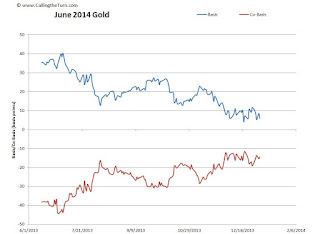 This eligible gold may belong to an investor, a refiner, a hedge fund, a bank or producer. Many times these people are holding the metal for their end customers. And it may move at any time, and is much more flexible than the warehouse receipts that are registered stocks. 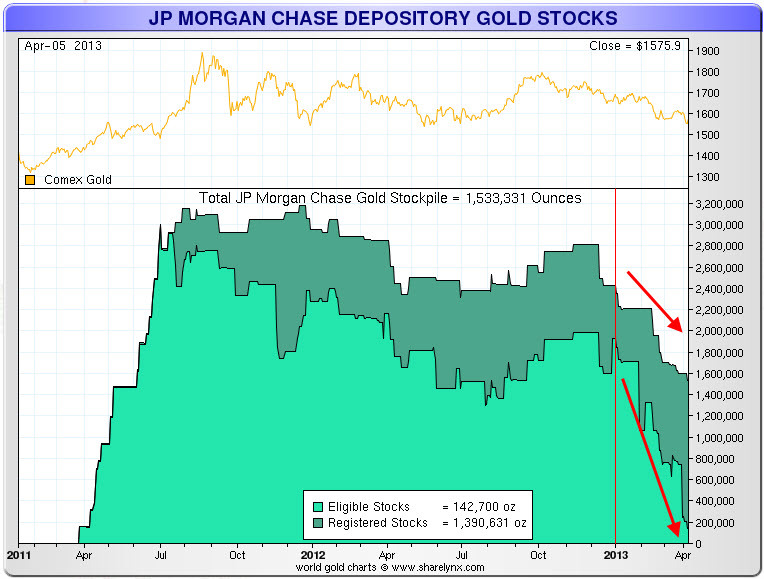 The CME, the exchange, does not have any direct control over nor interest in the size of eligible stocks. Registered stocks however are officially recognized by the CME for good delivery on the exchange. 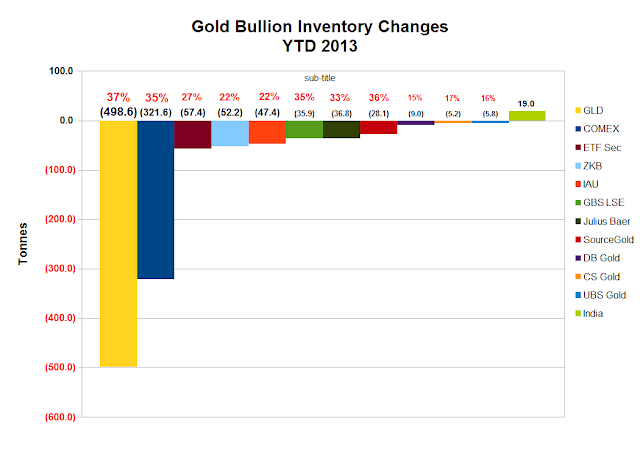 That means that this inventory exists and is set aside to make delivery against gold futures contracts. Traders who stand for delivery, rather than cash payment, when their contract settles take delivery of the warehouse receipt. 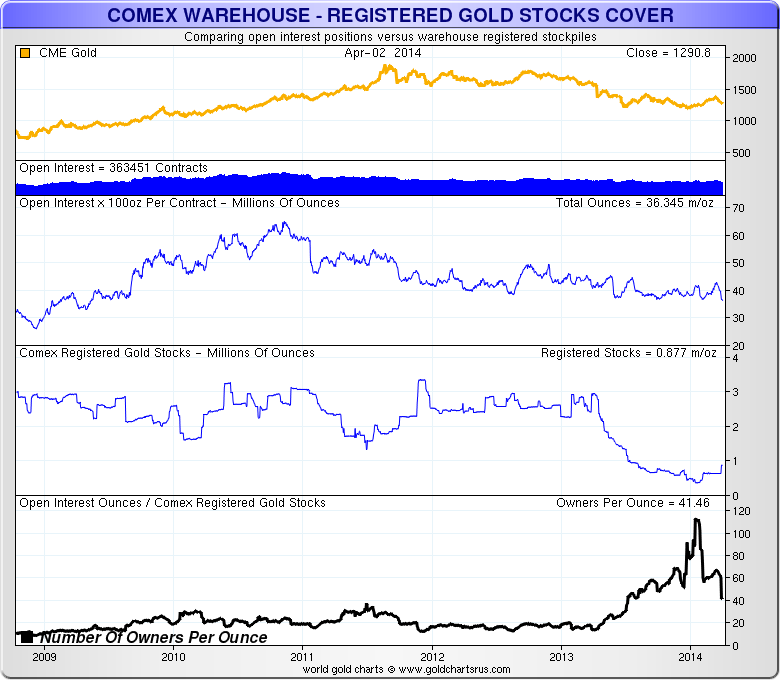 This does not change the quantity of registered stocks inside the warehouse. It remains registered, but the receipt changes ownership. 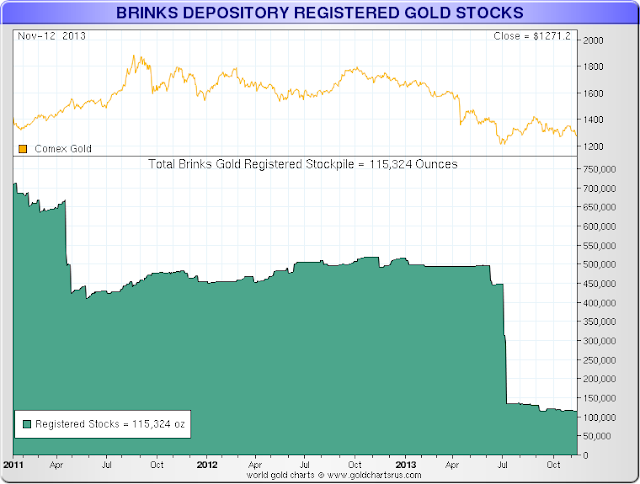 If a gold futures buyer wants to take physical delivery of the gold and "break" the receipt then this is possible. But it is a process and takes time. 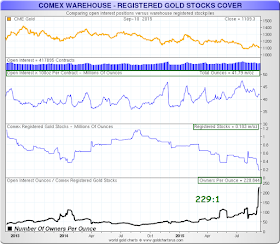 Once broken, if the gold remains in the exchange circle of integrity – meaning the exchange-approved warehouse – then those bars become eligible stocks. But if the gold bars are removed from the exchange-approved warehouse then they no longer are eligible and are no longer tracked in any way. 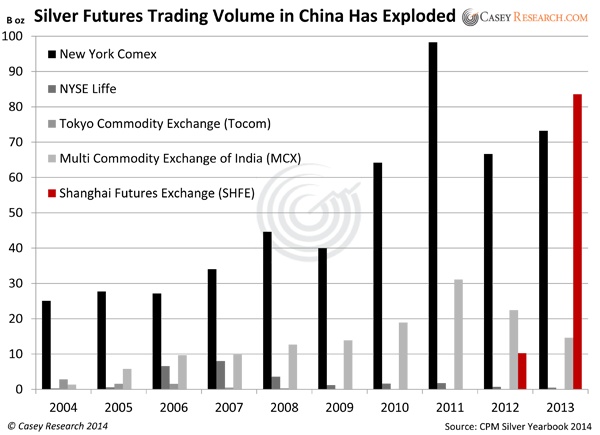 Third question then: How do the warehouse receipts work? A warehouse receipt is a bearer instrument much like a check. It can be endorsed from one party to another. The holder of the receipt pays the storage costs. Most times when people take delivery of a warehouse receipt they leave it with their brokers. In some cases people may want to take possession of the warehouse receipt themselves. This is rare, just like with equity or bond certificates; no one actually takes delivery of the documents any longer. But it is still possible for a fee. 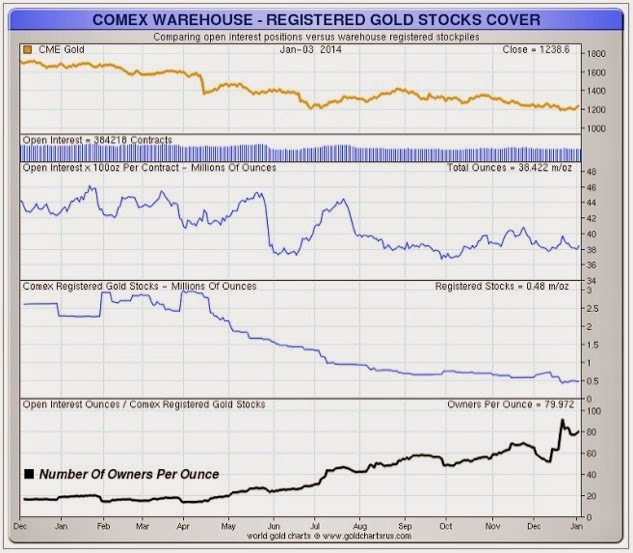 What happened in the Comex futures market since April 2013? 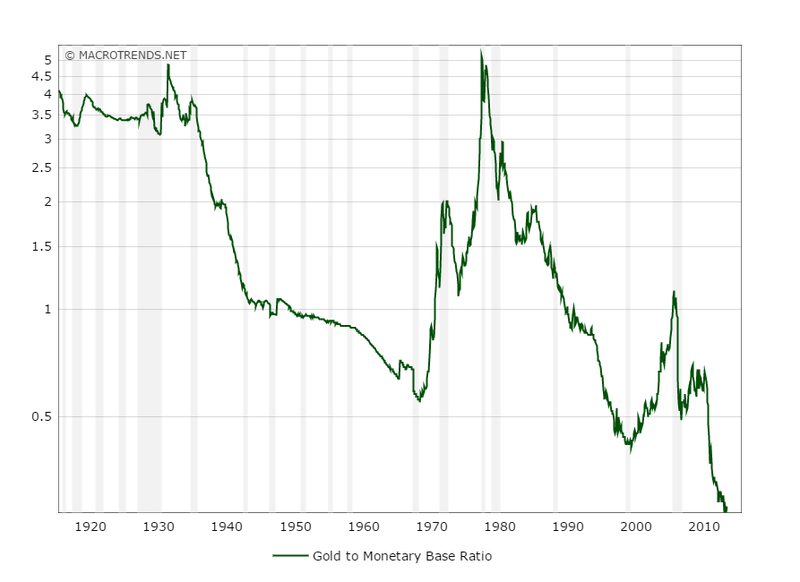 The Gold Money Index (or Fair Gold Price) is equal to the sum of Central Banks Foreign Exchange Reserves (reported in US $ equivalent) divided by the sum of Central Banks Gold Reserves (in troy ounces). 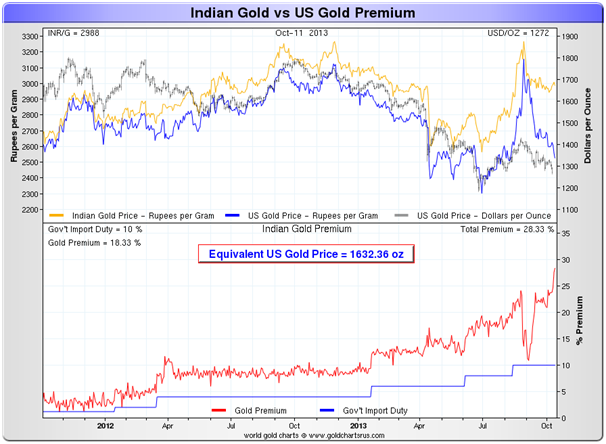 As of 6/30/2011, the actual price of gold was only 13.0% of its fair value. The fair gold price obtained by us using the last available official data in July 2013 using the top 98 countries reporting the largest gold reserves (excluding IMF and BIS) is: 13,670 US $ / t oz; the actual price of gold as end of May 2013 was 10.2% of its fair value. 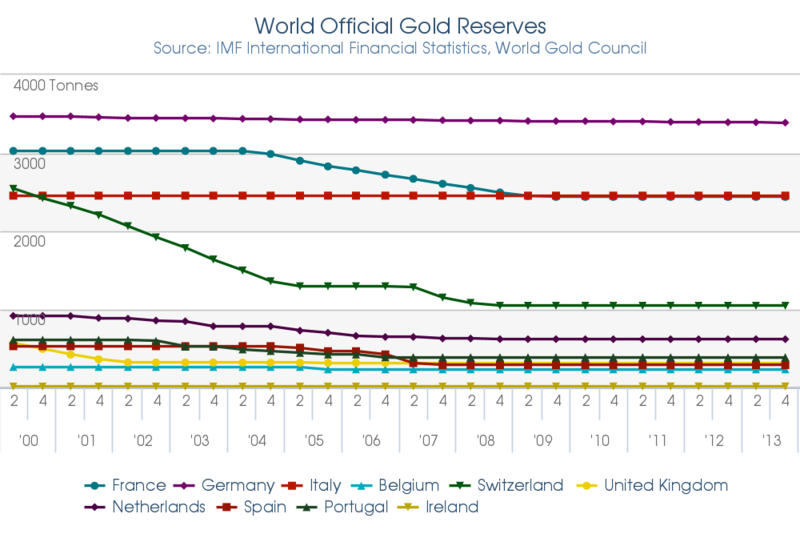 We can also calculate the value in mg of gold of all fiat currencies used in foreign exchange reserves = sum of mg of gold in top 98 central banks divided by the sum of foreign exchange reserves excluding gold. 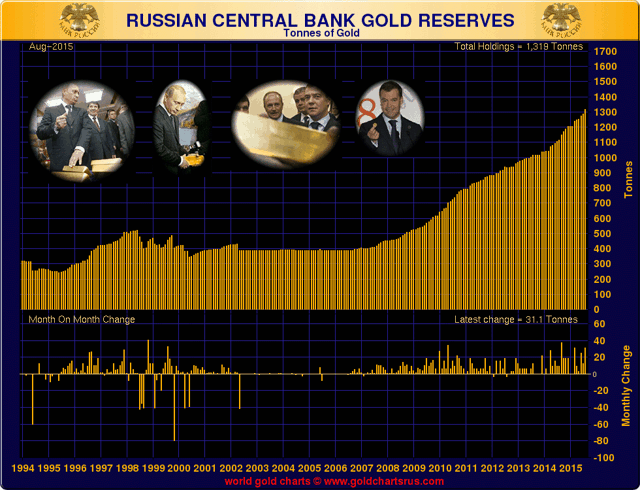 Basket composed by all fiat currencies used in foreign exchange reserves priced in gold, May 2013 : 2.53 mg per 1 share (1 share of the basket = 1 US$ equivalent). 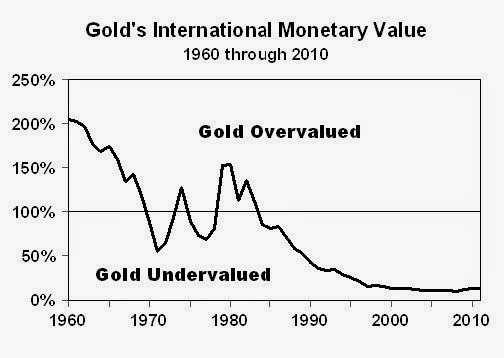 The meaning here is that the central banks require for themselves to own gold reserves for sustaining international trade (i.e. 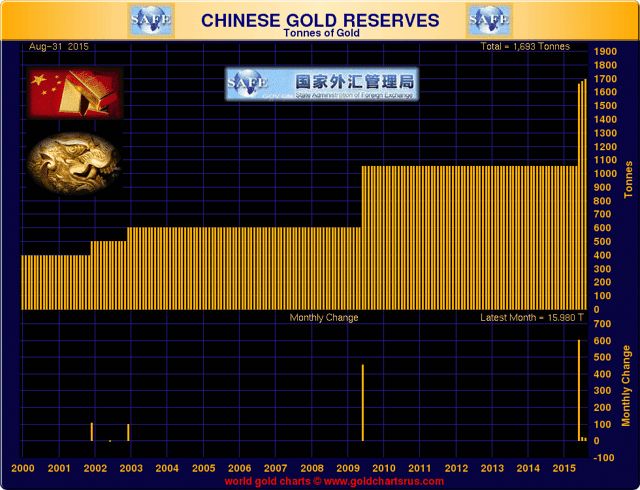 for sustaining their foreign exchange reserves). 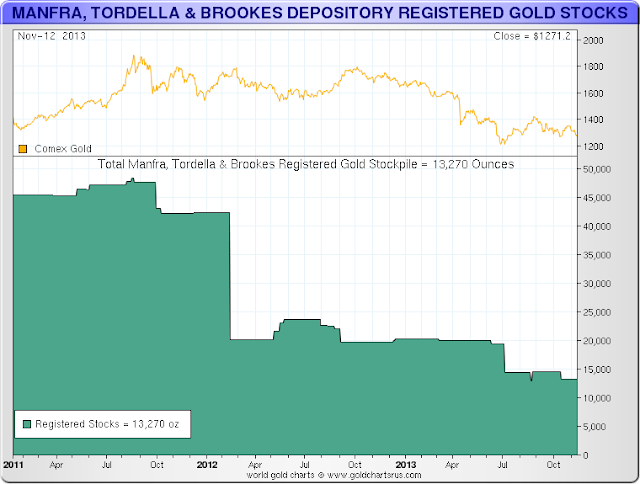 The current amount of gold required, in the floating basket of currencies is 2.53 mg of gold per 1 share of the basket. 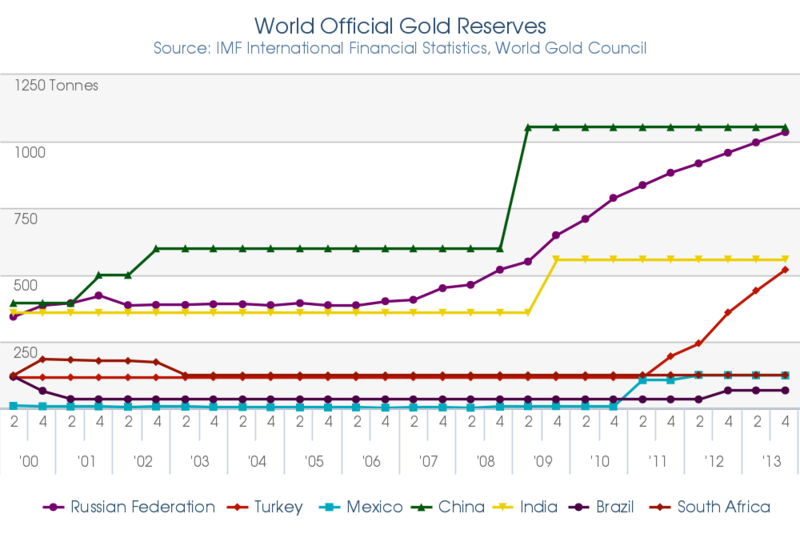 Note: the used IMF data assumed US gold reserves to be 24 carats fine gold; the correct grade is 22 carats because this gold came from the melting of confiscated gold coins in 1933, and were stored without refinage. They were 22 carats gold coins. 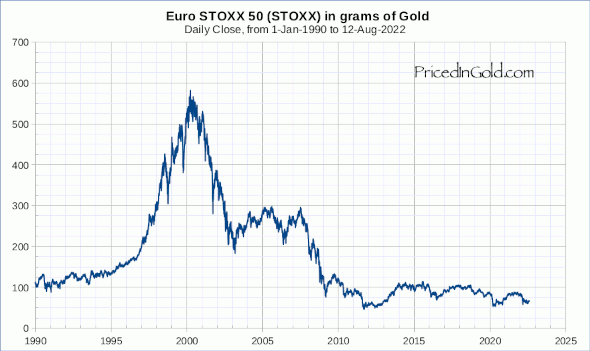 This gold is then easily traceable in the market because all other bullions in central banks are .995 or better grade (24 carats). 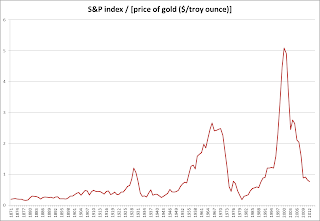 History shows this question has only one answer: gold markets are extremely centralized, and subject to opaque arbitrage by big players (Central Banks, bullion banks...) and market dominance in order to push down gold price when necessary. It is not a free market. 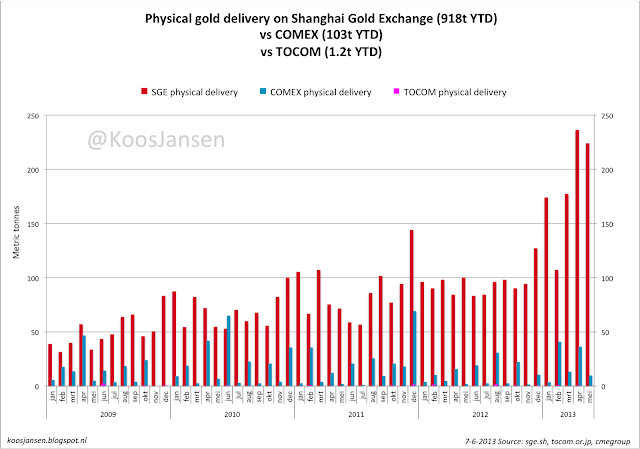 Gold is always heading where the most influential policy makers are pushing... but not always in the direction they imagine they are pushing in, as we are seeing now because of new extreme market conditions (backwardation, deflation). Big players are loosing control day after day. 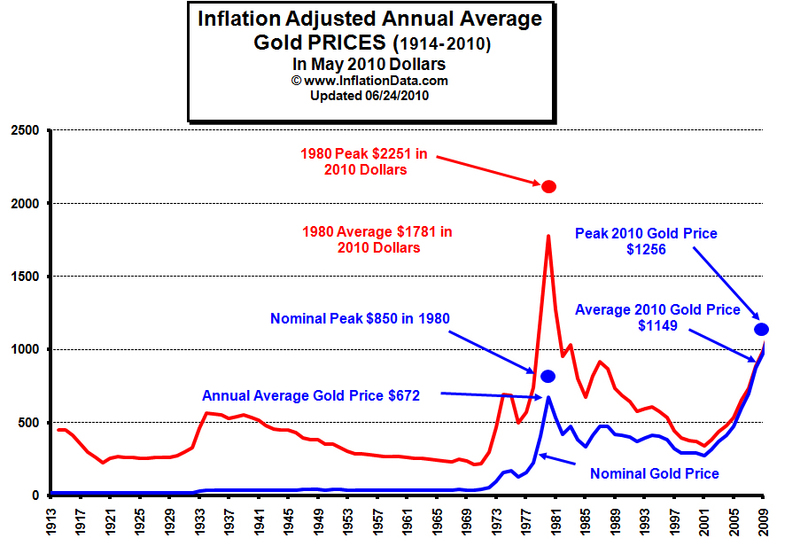 At the extreme, there will be no more gold market (not even a rigged market), because there won't be any more a centralized market. There will be only barter, the basic and original distributed form of market. 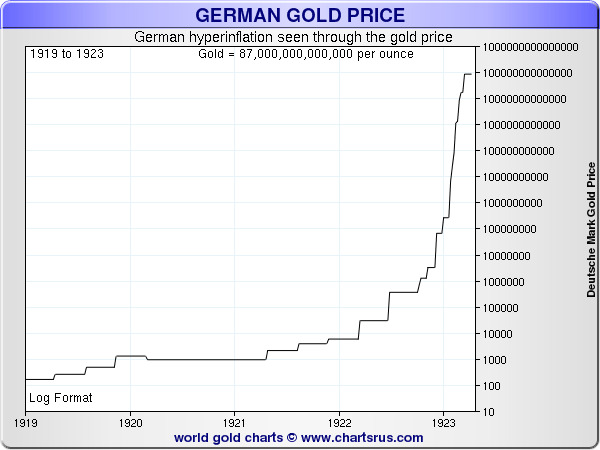 But there are two possible forms of end game: hyperinflation and hyperdeflation. Both are terrible, but the second is an even worse pain. 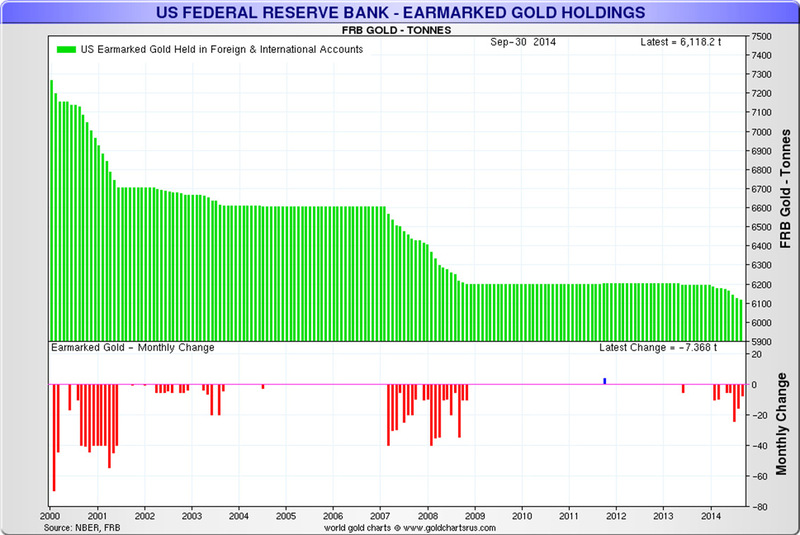 The only action by the FED is to delay some time then only choose between this two paths when events will accelerate. 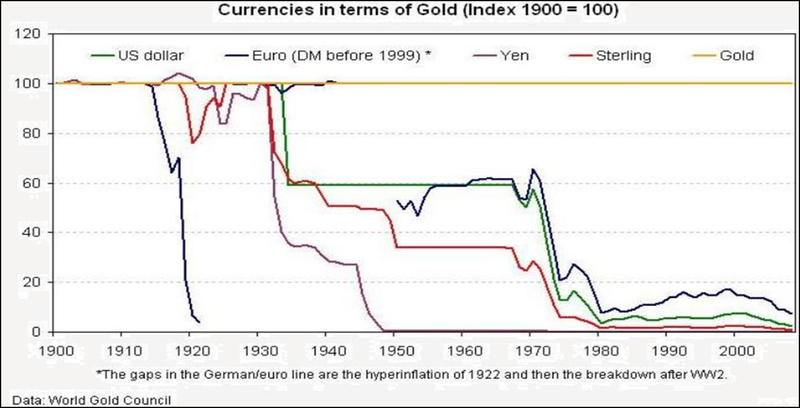 If they do nothing more than today then hyperdeflation will occur... even if they wish for hyperinflation because they do not use the correct monetary theory! Even with an hyperQE they cannot change that. 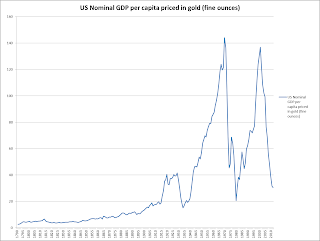 But with destruction of production capacities inside US territory (confiscation, rebellion, mass riots...), we could see hyperinflation occur. 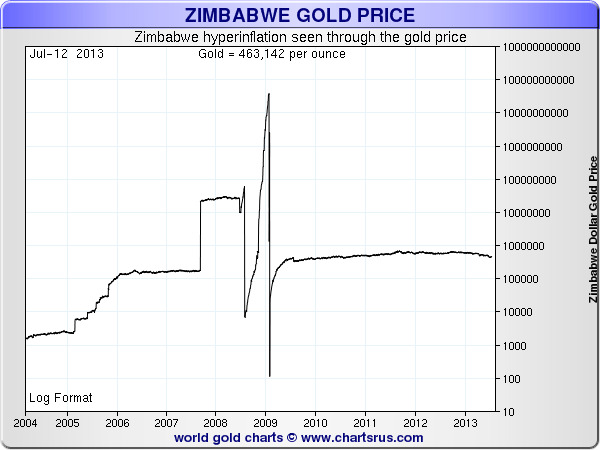 Some people in the banking system could think they would have a much better chance with hyperinflation, because they would be the "first persons to be served". This is another illusion. 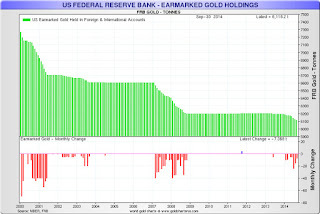 The american people will destroy the FED in both cases. 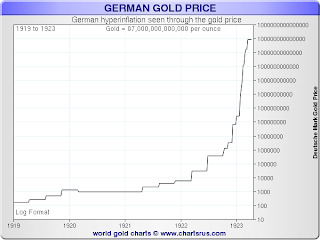 Where is the price of gold heading during hyperinflation ?